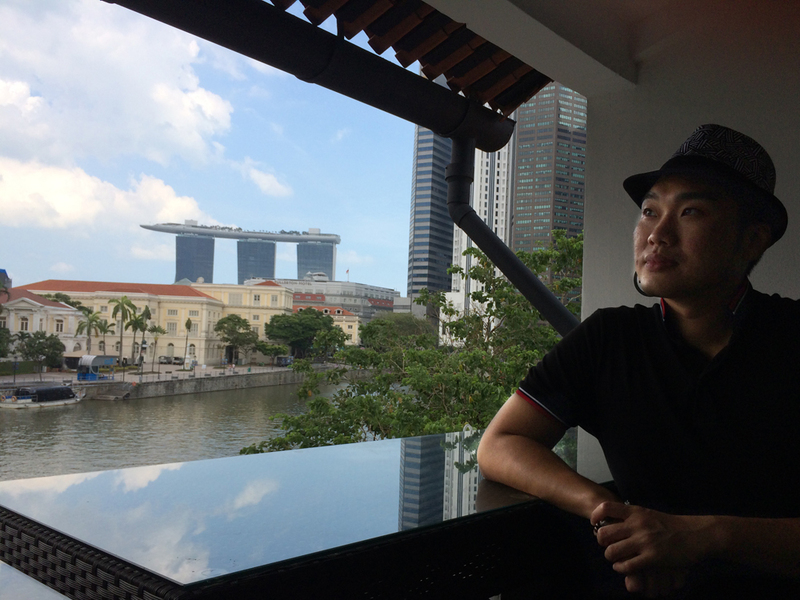 Singaporeans are no stranger to Malaysia’s capital city. From hi-tea to buffet, gourmet burger joint to street food, Kuala Lumpur (or KL as it’s commonly called) has it all. On my recent trips to visit a friend who stays in Jalan Ampang, I’m rediscovering the city through my stomach and beginning to fall in love with it once again. Here are some of our favorite food places to visit in KL. Started in 2012, My Burger Lab currently has two outlets. 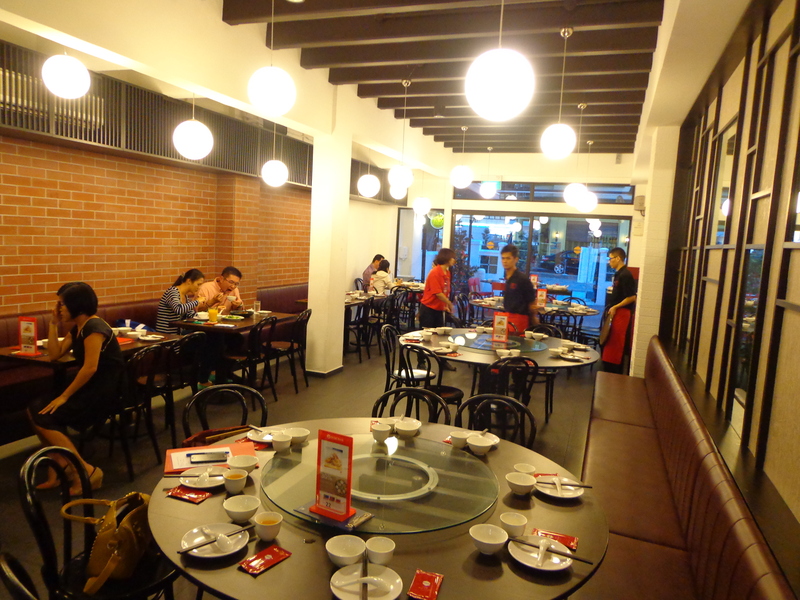 When we arrived at the newer outlet at Taman OUG around 8pm, it was almost full house. My friend waited in line for 15-20 minutes before they could take our orders. While he was waiting, my eyes were scouting for a table for us. The interior decoration was minimalist with Ikea-style lighting hanging from the ceiling, but everyone seemed to be having a good time digging in and busy eating. Sometimes, this place sold out their patties by 9pm. 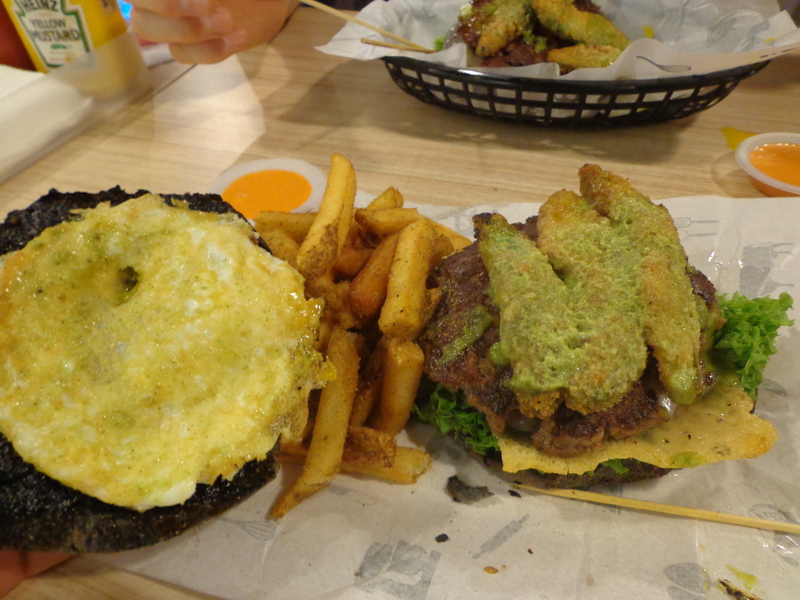 We had The Hulk burger – ground beef patty, fried avocado, green salsa sauce, fried egg at RM18.50 each. The Hulk set meal with fries and a drink is at Rm24.50. I couldn’t believe my friend upsized my big burger meal by ordering an extra beef patty (RM5.50) for me. According to my friend, the fries are hand-cut and fried in olive oil. The dinner crowd usually starts from 5pm onwards till closing. The other outlet at Petaling Jaya is much more crowded than this OUG outlet. 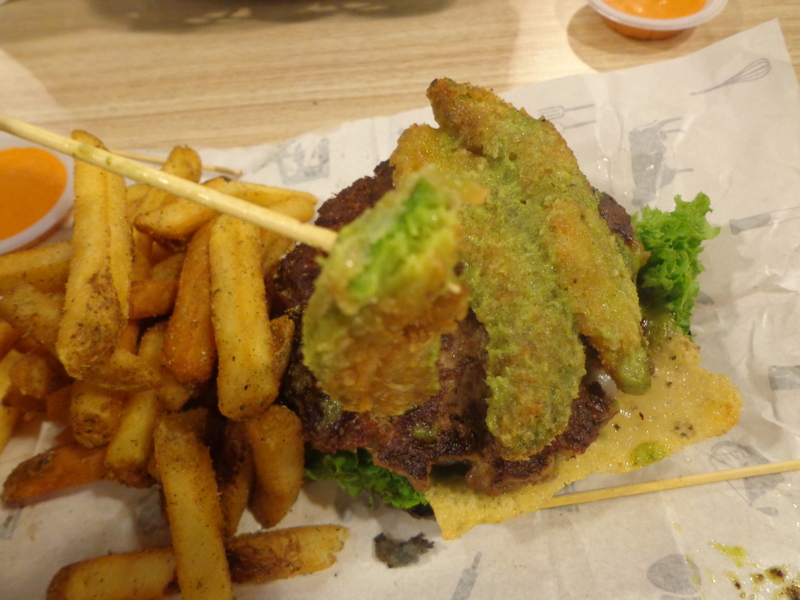 I stared hard at the strange combination of seaweed sauce, fried cheddar cheese, fried avocado with the ground beef patty. 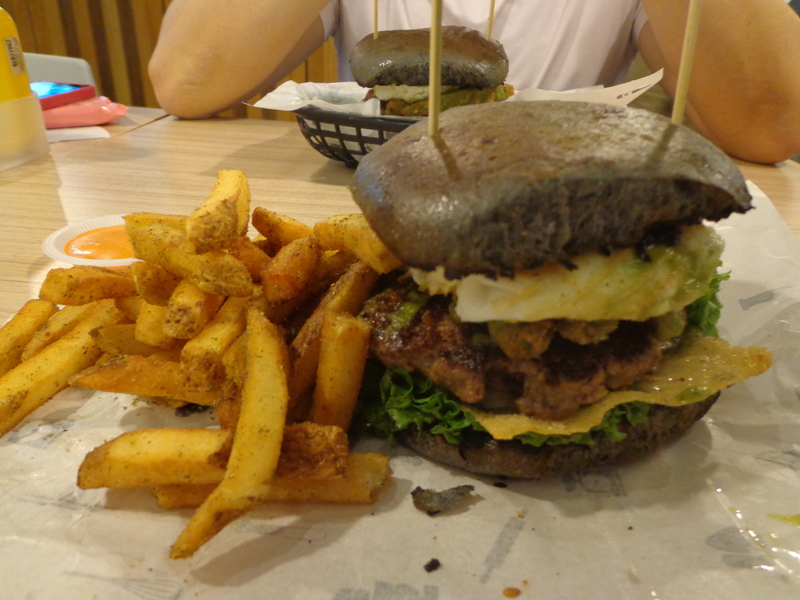 I shut my eyes and sank my teeth into the charcoal burger. Without a doubt, it was one of the best I had ever tried, probably better than Fergburger in Queenstown, New Zealand. But you really have to be a burger lover to soak in all the extra calories. Sign up for their VIP card and enjoy 15% discount on purchases. Burgers starts from RM 11 onwards, chicken and vegetarian opinion are available. And yes, they are Muslim-friendly too. 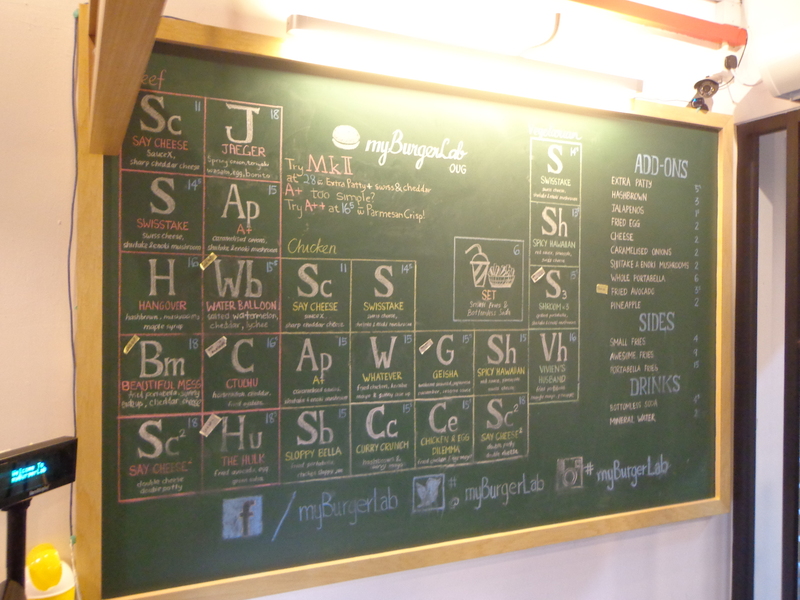 My Burger Lab (OUG Lab) is located at 8, Jalan Awan Hijau, 58200, Kuala Lumpur. 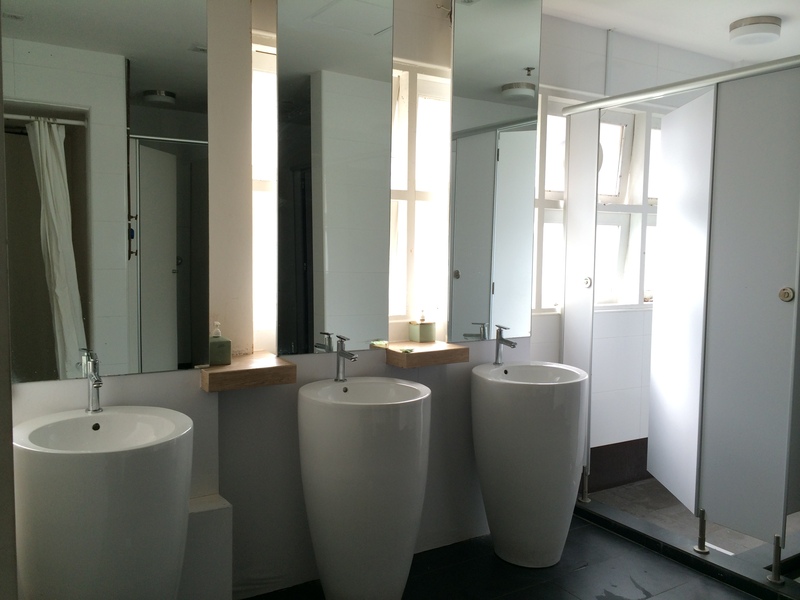 The other outlet (Seapark Lab) is located 4, Jalan 21/22, 46300, Petaling Jaya. 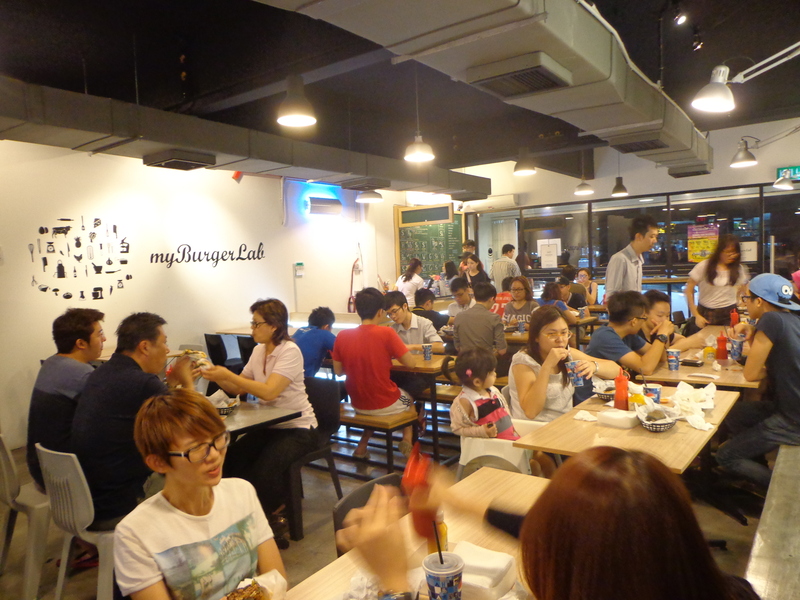 Visit their Facebook or website MyBurgerLab.com for more information. You can also spy cam and check the crowd-situation before heading down. In my humble opinion, the best things to eat in KL is not just colonial style western burger but the open-air hawker places in town. 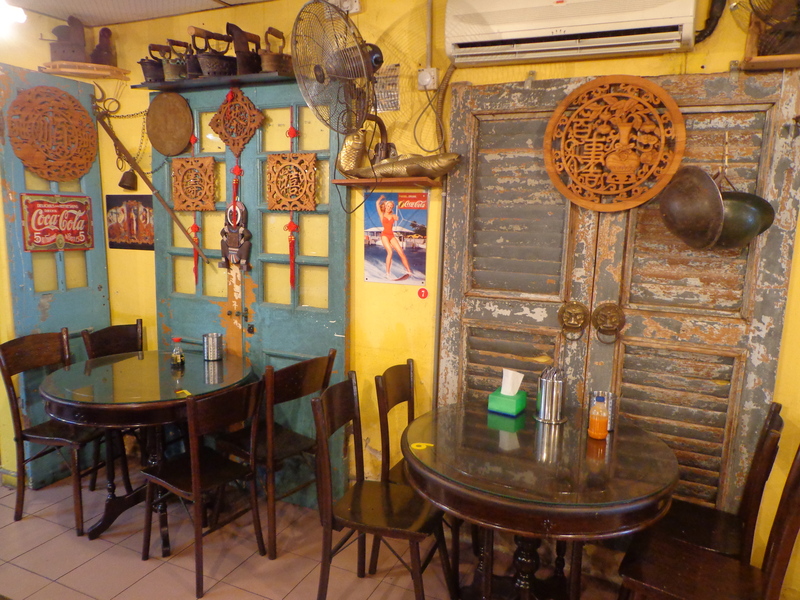 A short drive from Jalan Ampang is the popular place in town for lunch among the locals. Unfortunately, like the Lavender Food Court in Singapore, this heritage hawker place is making way for commercial development. In its place, Tun Razak Exchange (TRX) will take over. I always think that only in a land scare country like Singapore will face such problem, but looks like our neighbour up north is also losing food heritage thanks to modernisation. That afternoon, I slurped up the Wanton Mee with much gusto. They used cabbage instead of spinach. And the char siew was done just right – tender yet tasty. As usual, my friend loved to put extra meat in my order. I also tried the Curry Laksa Noodle from the same stall while he ate his special order of Veg & Chicken Kway Teow. 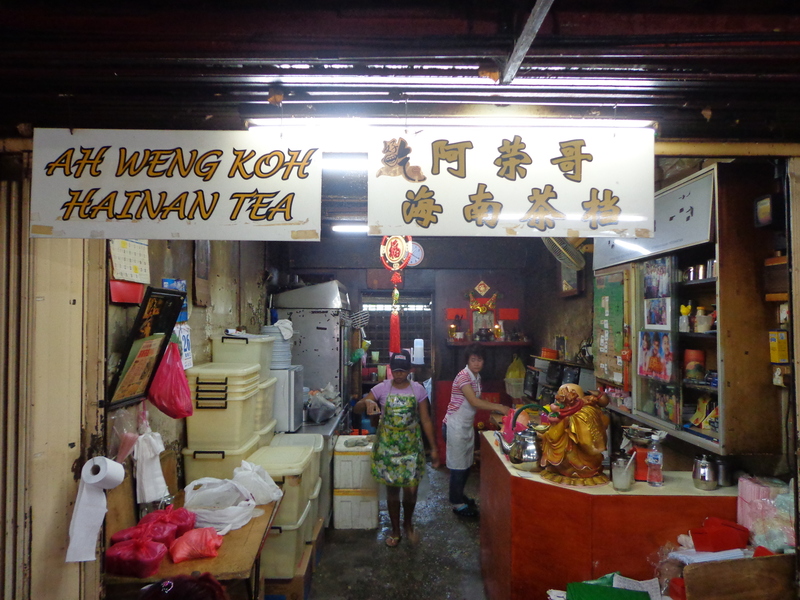 Ah Weng Koh’s Hainan Tea is highly recommended to complement the meal, it’s blended with coffee power, and tastes like Yuanyang (mixture of coffee & tea). Pasar Bukit Bintang, otherwise known as Imbi Market is located at Jalan Melati, 55100 Kuala Lumpur. Here is a Google Map of its location. Hurry and go before the rustic place is demolished! En route to Changi Airport, when the taxi driver found out that I was going to KL, he said to me, “When you are in KL, remember to eat their Bak Kut Teh, they are the best in Malaysia. Very famous, every time uncle goes there, sure will eat one.” Thanks to his heads up, I asked my friend to bring me to his favorite venue for the regular meat-bone-tea (Bak Kut Teh) fix. Our big bowl of Bak Kut Teh came in a clay pot, topped with fried beancurd skin, vegetables and tender pork. I scooped a mouthful of soup and savored the awesomeness. It tasted almost as good as the famous Yu Kee Bak Kut Teh I had in Kota Kinabalu, Sabah many years ago. 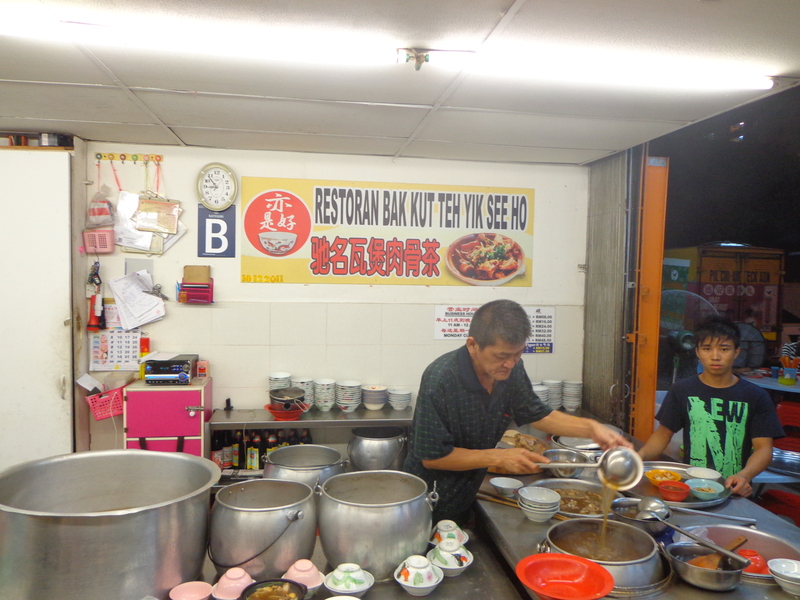 A bowl of Bak Kut Teh starts from RM8.00. 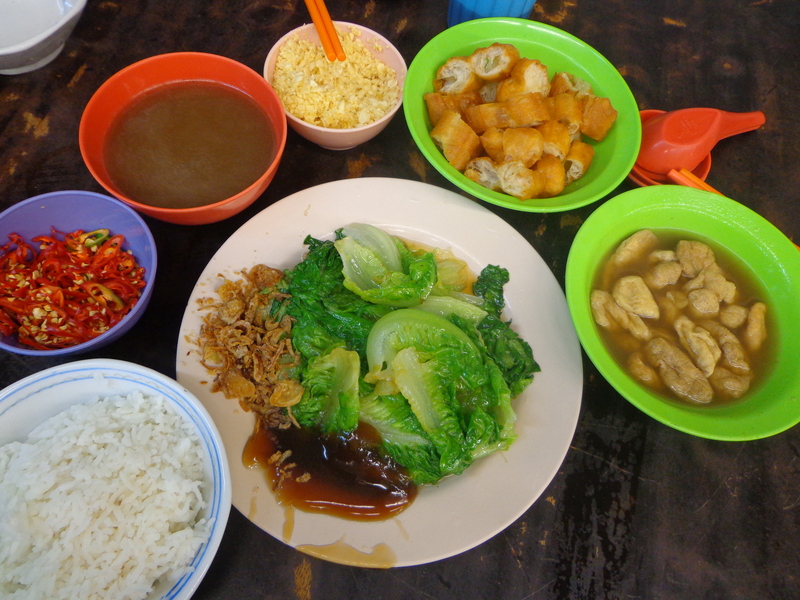 We had the Bak Kut Teh in Claypot at RM18.oo, and ordered various side dishes to complement it. One of my favorite ways of eating Bak Kut Teh is to drink the soup, bite off the meat, dip and soak Youtiao (You Zha Gui) into the soup to finish off the broth. 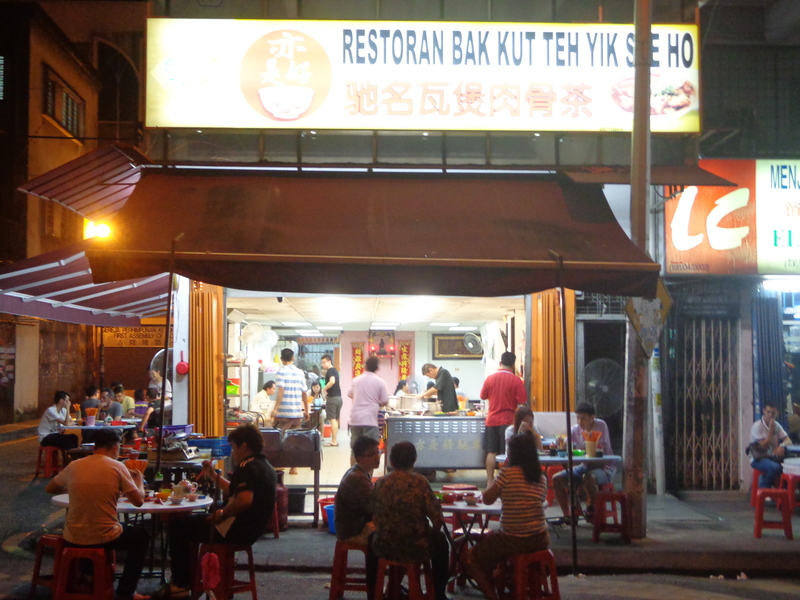 Restoran Bak Kut Teh Yik See Ho is located at No. 20, Jalan Landak, off Jalan Pasar, Kuala Lumpur. For enquiries, please call Calvin Wong at +601 2789 2293. Opening hours from 12pm to 1am, closed on Monday. 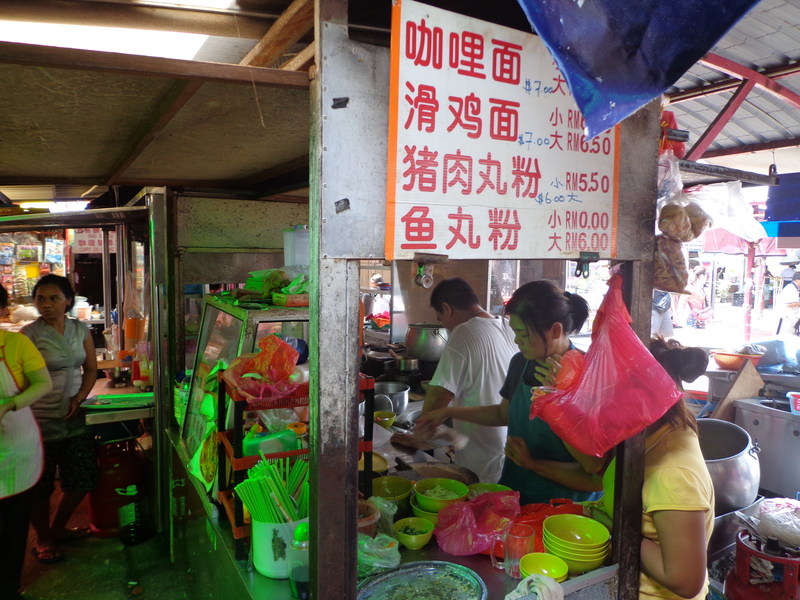 I used to patronize Jalan Alor for hawker food when I stayed around Jalan Bukit Bintang area. But recently I discovered this coffeeshop that served yummy zhi char near the shopping belt of KL. I love it so much that I requested for my friend to bring me there again on another evening before watching movie at Berjaya Times Square. We ate the Hokkien Mee and shared a plate of Braised Yee Mee together with two other friends. 1 person serving is priced at only RM8.50 and two-person sharing portion starts from RM16.00. We also ordered the barbecued chicken wings from across the street to complement our dinner. Do come early to secure a seat for dinner. 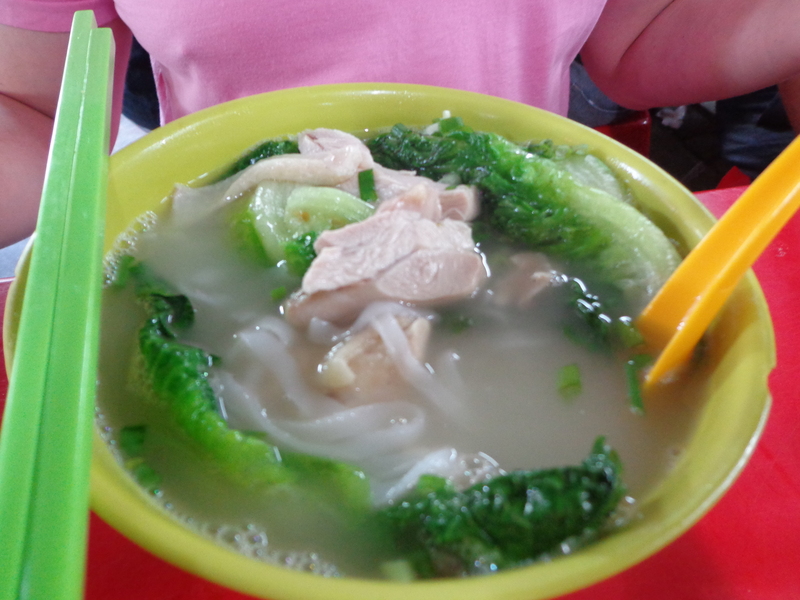 I also heard that their fish-skin wonton noodle soup and egg tarts are very popular items for breakfast and lunch. 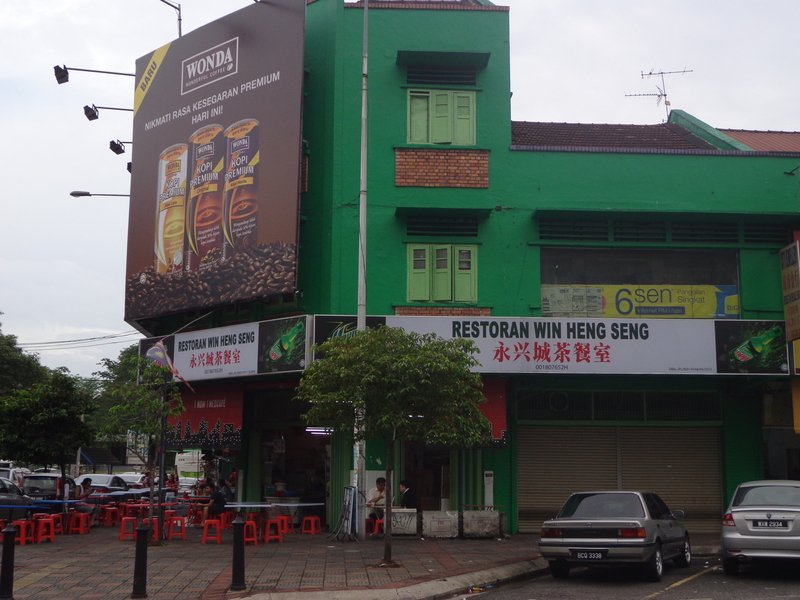 Restoran Win Heng Seng is located at 183 Jalan Imbi, 55100 Kuala Lumpur. It is at the cross-road corner of Jalan Barat and Jalan Imbi, opposite Honda showroom, right in the heart of Kuala Lumpur. Walking distance from Pavilion shopping mall and Berjaya Times Square. Looking for a place to chill or a dessert venue? Alexis Bistro & Wine Bar (Ampang) located at Great Eastern Mall is my recommendation. Known for their popular weekend lunches, firewood oven pizza, weekend jazz performances showcasing local and international talents every Friday and Saturday. 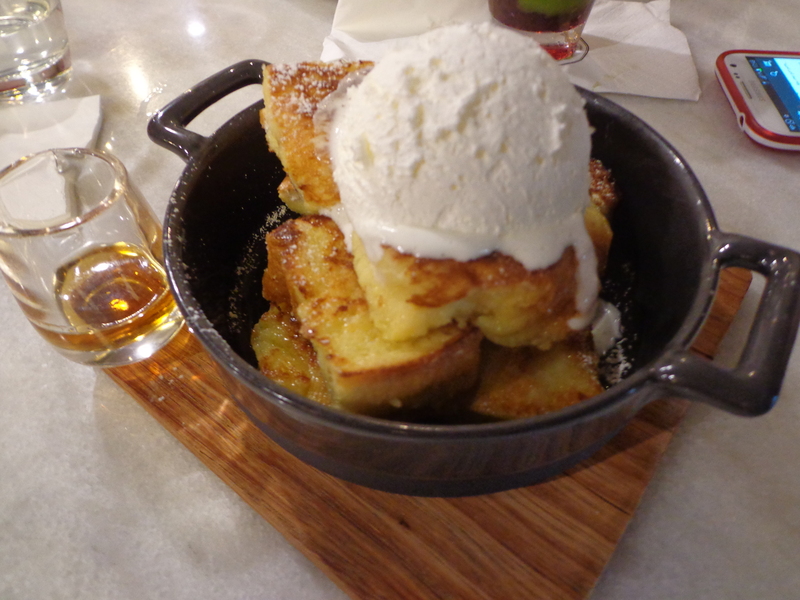 We headed over to Alexis Ampang on a weekday evening after our dinner to enjoy their dessert with a pot of hot tea. There’re 5 outlets (including Sino – The Bar Upstairs) spread across Kuala Lumpur. Alexis Gardens at Mid Valley City has always been the post-work out temptation for my friend. As a dessert connoisseur, the no. 1 recommendation I have for you will be their Tiramisu – the best in town. Cognac and coffee soaked layers with the fluffiest cream topped with sweet, crunchy, caramelised pecans, served with a “bloody” puddle of strawberry sauce by the side. I kissed my diet plan good-bye as I sinked my teeth into this sinful-icious treat. Served best with a pot of lemon grass tea or a glass of dry white wine to accompany Jazz performance on a Friday or Saturday night. May it be a sweet dream for you tonight. Alexis Ampang is located at Lot 10 & 11 Great Eastern Mall, 303 Jalan Ampang, 50450 Kuala Lumpur. Call them at +603 4260 2288 to make a reservation. Visit their website www.alexis.com.my to find out the locations of their other outlets or to view the schedule of the upcoming live performances. KL Sentral is indeed the main transport hub of Kuala Lumpur. As a leisure traveller, I prefer to arrive early at KL Sentral to avoid the evening rush hour jam and to enjoy a scrumptious spread of delicacies before embarking on my way to the airport. Walking into Nook at Aloft KL Sentral Hotel, I felt that I was transported to the future with its futuristic white pods and the green and white interior decoration. It was minimalistic yet chic. 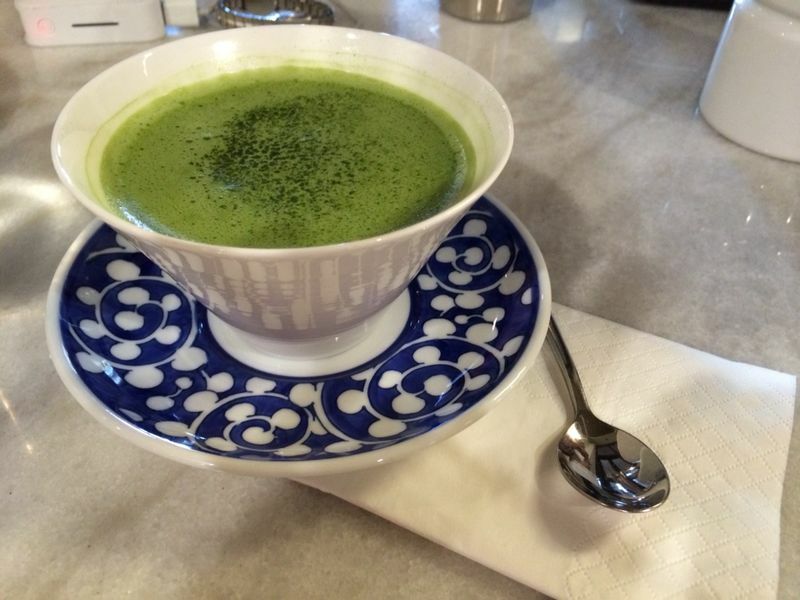 The green decoration reminded me of pandan leaves and kaffir lime. 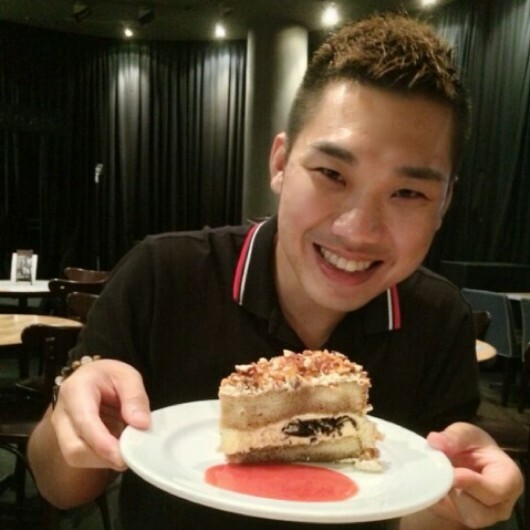 Nook’s menu is created by Executive Chef Steven Seow and his team. It is a combination of local flavours and international delights, mixed with texture and freshness. Among the buffet favourites are smoked salmon, fresh prawns and mussels, charcoal-grilled satays, and the wide smorgasbord of colourful desserts made for a happy ending. 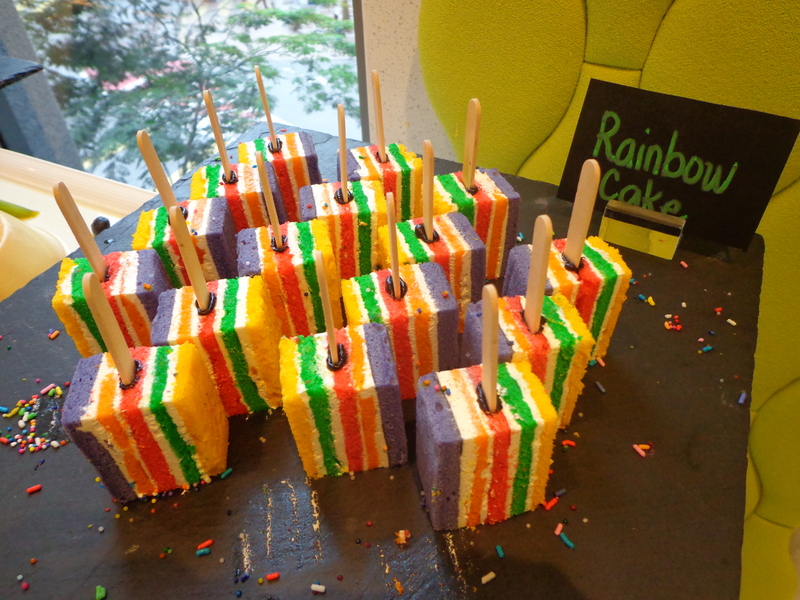 Nook at Aloft Kuala Lumpur Sentral is located at No 5 Jalan Stesen Sentral, Kuala Lumpur 50470. Call them at +603 2723 1188 for reservation, or visit their website and Facebook for more details. Buffet dinner is from 6.30pm to 10.30pm at RM70.00 nett per adult. Unfortunately it’s not always a happy ending. I love KL for most of its glory but there are always people out there who are dishonest to tourists. During one of my recent visit, I was traveling back from Penang to LCCT by AirAsia. Normally I would take the shuttle bus from LCCT to KL Sentral, which cost less than RM10. But being a late night flight, my friend and I decided to hop on to the taxi. First, there wasn’t any clear signage. When we reached the taxi queue, we were told to purchase a ticket from the counter. I searched the arrival hall, only to realise the small counter was tucked inside the arrival gate. Hence I had to run back to get my passport and back to the arrival hall to explain to the custom officer to allow me back to the arrival gate. It didn’t help that the custom officer was showing attitude when I mentioned why couldn’t the taxi counter be outside the arrival gate. She stared at me and shouted, “What’s your problem?” Besides her horrible service attitude, the bus counter lady charged me more than RM120 for a trip for two adults with one luggage from LCCT to Jalan Ampang. According to my friend, he usually pays around RM70-80 when he takes a cab from KLIA. He told me that Jalan Ampang was a long road and the counter lady should have asked exactly where I was going, instead of charging us the maximum rate. My two-cent worth, if possible, hop on to the shuttle bus (traveling to KL Sentral) to save some cash, then take a taxi or train from KL Sentral and transfer to your hotel. Otherwise, be clear to mention where you are going, cos there are always dishonest people in this world who are out there to cheat tourists. Stay smart! Mother’s Day is just one month away. What will you be giving to mommy dearest this year? In our family, Mother’s Day is one of the significant occasion besides Chines New Year and birthdays. 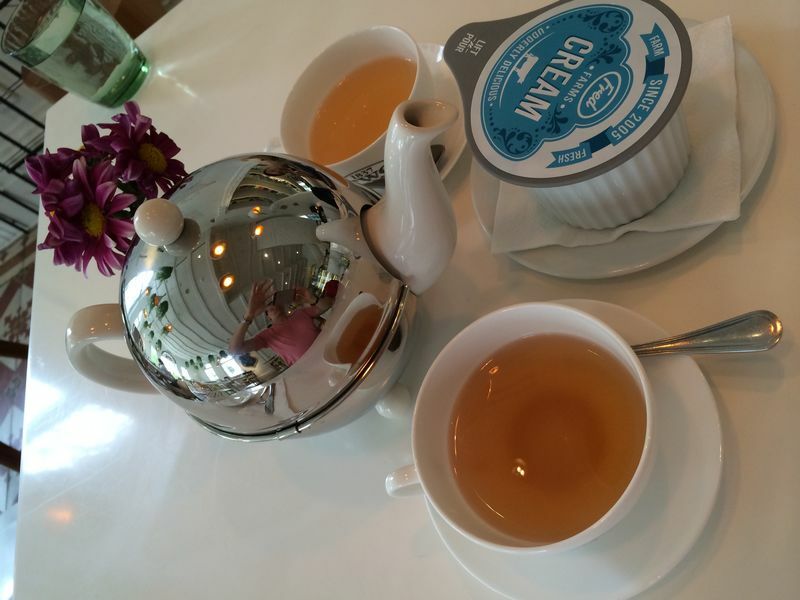 Whether you’re thinking of restaurant treat – Chinese or Western cuisine, or a facial spa, recently I checked out 3 great places (in no particular order) to recommend for the woman we love. A fine dining British cuisine destination that serves interpretations of classics with a modern twist, where roasts and prime rib take centre stage. The Royal Mail transports guests back in time with a touch of Old World elegance. If you have received your mid-year bonus from work, this is the place to bring the person you love – be it your mom or your significant other to, for causal fine dining western cuisine. I highly recommend a weekend brunch for mom, or after 6 dinner with your date. Must try items are the Pan Seared Foie Gras, Sous Vide Half Maine Lobster, Beef Short Rib, Deboned Fish of the Day (serves 2 pax), Lobster Linguine and Kurobuta Pork Chop, and their desserts! Starters priced from $13 onwards, main courses range between $28-$68 per serving, sides from $8 onwards, desserts from $13-$$15 per person. For two persons sharing, the cost will be around $100 to $150. Order their starter – foie gras or lobster, select deboned fish and beef short ribs as main course, and share one of their sinfully yummy desserts. The Royal Mail Restaurant & Bar is located at The Ascott Raffles Place Singapore, 2 Finlayson Green, Singapore 049247. Visit their Facebook or website www.theroyalmail.sg for more information. Call 6509 3589 for reservation. 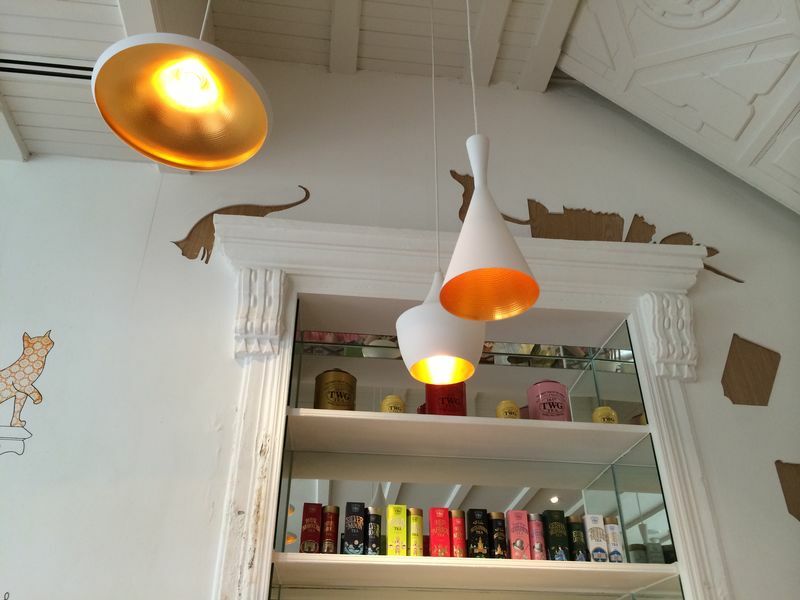 Open on Monday – Friday for breakfast, lunch and dinner. Serves breakfast and dinner on Saturday, and only available for breakfast on Sunday & public holiday. Lobster Linguine ($28), very reasonably priced. The grey bubble-like is actually Squid Ink Espuma. Roast Prime Rib (Classic Cut, 280g) at $58. I would highly recommend the Braised Beef Short Rib ($36) instead, the latter is more tender. Photo not available. Side dishes (from left clockwise) – Braised Green Lentil du Puy ($8), Sauteed Chestnut & Grapes ($12), Casserole of Mushrooms ($8), and Baked White bean Ragout Pot Pie ($10). Nothing particularly outstanding with the sides. Foreground – Banoffee Tart ($13). Background – Eton Mess ($15). Maybe western dining is not your thing. Then, come to Red House where they’re celebrating their 38th Anniversary with new seafood creations and set menus. Its seafood are sourced from Scotland and flown in three times a week to maintain freshness. 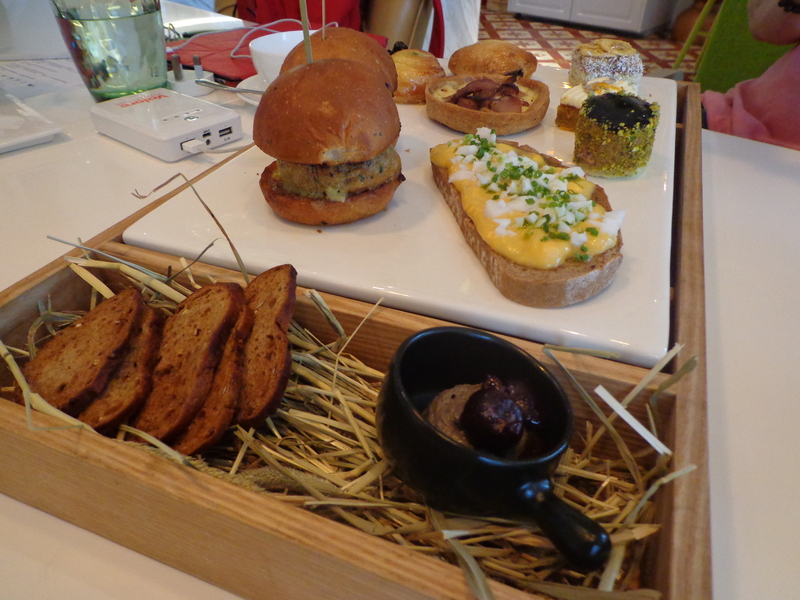 Red House’s 38th Anniversary ‘Modern’ Anniversary Set Dinner offers seven courses at $388 for 6 persons. Inclusive of a bottle of Perrier-Jouet Grand Brut champagne OR Domaine Leflaive Macon-Verze 2010 premium French white wine OR two jugs of Tiger Beer .Valid till 30 June 2014 at Prinsep Street outlet only. There isn’t anything that I don’t like about their ‘modern’ set dinner. The Chilled Spicy Whelks, Scottish Blue Lobster Coated with Sweet Mayonnaise, Garlic Steamed Megrim Fish, Scottish Brown Crabs in White Pepper, and Oyster ‘Yuan Yang’ Hor Fun are worth the extra calories on my cheat day. I highly recommend the champagne or white wine which pairs very well with the seafood. 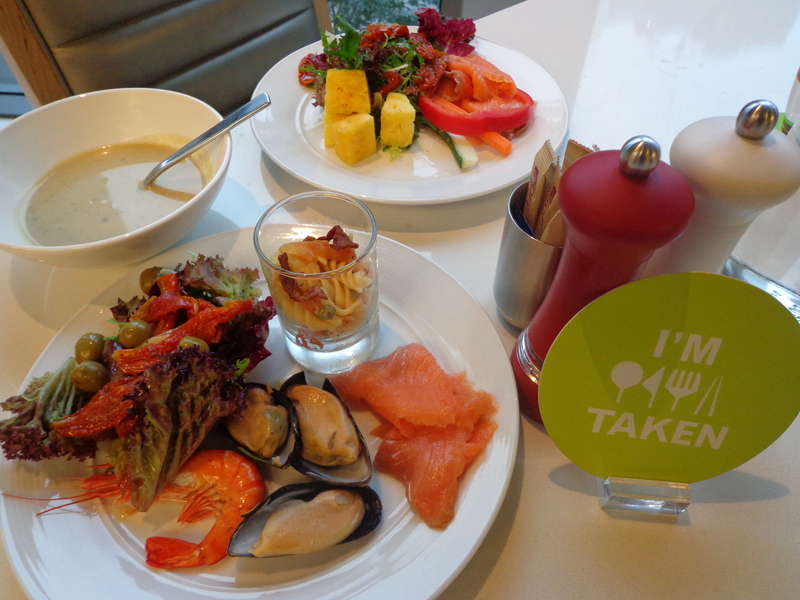 If you’re looking for a smaller affair, then try their new five-course set lunch at only $38 for two persons. Available daily, this super value for money set lunch comes with Dim Sum Basket of Siew Mai, Mixed Mushroom Dumpling, Scallop & Chives Dumping, Oven-Baked Char Siew Pau, Creamy Custard Prawns, Oyster ‘Yuan Yang’ Hor Fun, Fried Daily Greens and homemade Durian Mochi. 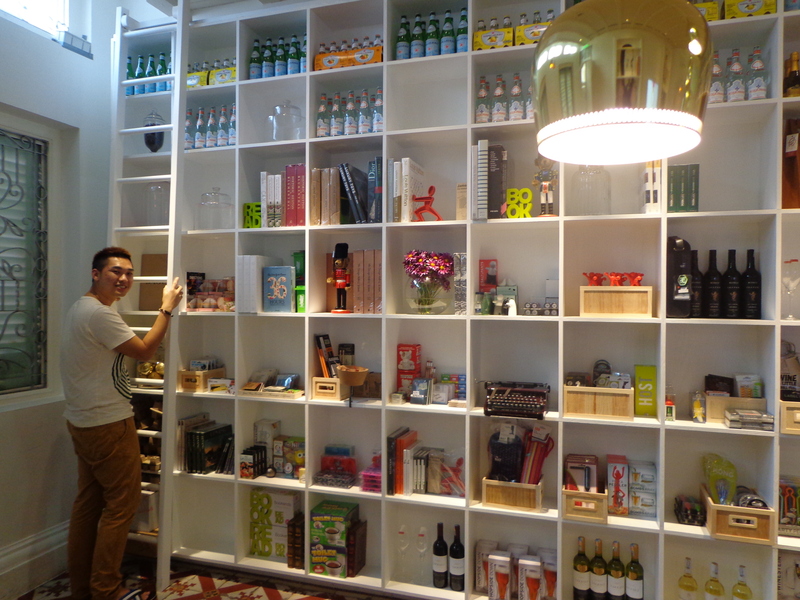 Red House’s flagship outlet is located at 68 Prinsep Street, Singapore 188661. Visit their website www.redhouseseafood.com for more information. Call 6336 6080 for reservations. Open for lunch & dinner from Monday to Friday, and all day-dining on Saturday, Sunday & public holiday. Additional notes: They have two other outlets located at East Coast Seafood Centre and The Quayside. Red House is voted “Best Chili Crab 2008” by Time Out Singapore Magazine. Another must try is their new Chili Crab Baos, order them to complement your meal (not included in set lunch or dinner). Chili Crab Bao (3 for $8), available during lunch only. Not included in set lunch. Highly recommended. Durian Mochi, made with REAL durian inside! With 30 years of skin expertise, LPG from France has created a revolutionary way to re-plump hallowed cheeks, firm up sagging skin or even detoxify skin with the Endermolift New Generation. I discovered this new technology at Beauty Asia 2014 and very impressed that it is a 100% natural solution and results are obvious after just 10-30 minutes of treatment. At first I was skeptical, it took at least 3 treatments at Sylvia Skin Atelier to show some improvements on my face. I’m pleasantly surprised that within just 30 minutes of Emdermolift treatment my dark eye circles and acne are significantly reduced. 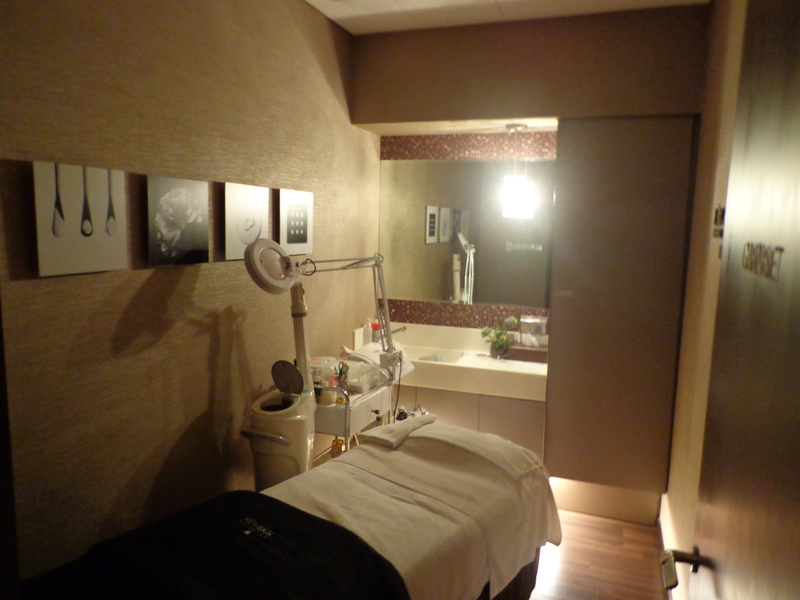 There is no regret going for the detox treatment instead of anti-aging as recommended by Spa Elements’ consultant. With over 40 different treatments, there is a suitable solution to boost your tissue stimulation. My mother will be very happy to know that Endermolift naturally stimulates the production of hyaluronic acid by 80%. Hyaluronic acid is produced naturally in our body. It has important action on hydration and volume and renowned for its anti-aging qualities. 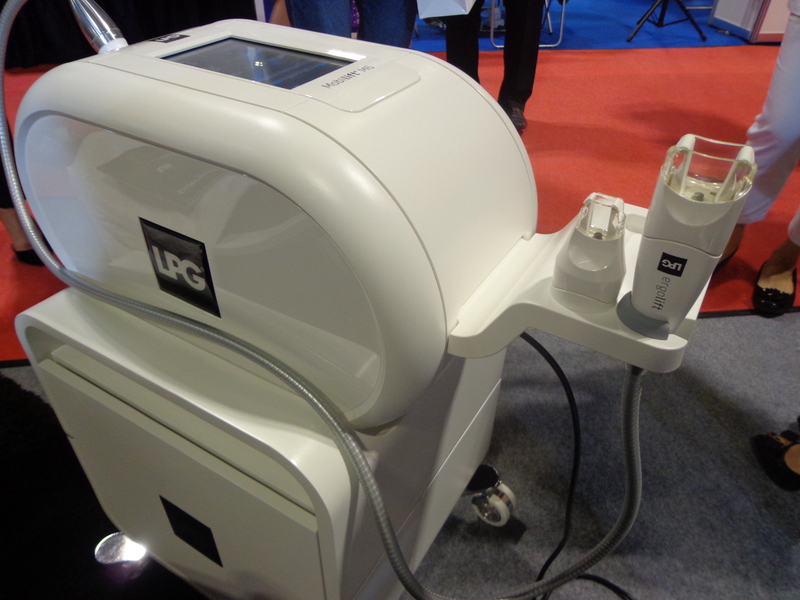 LPG treatment starts from $200 for 10 minutes on target area treatment. I tried the LPG Classic 30.60 (Detox) which includes cleanse, steam, 30 minutes of LPG, premium mask, protection at $450 for 60 minutes. Spa Elements also have a couple room, so you can either bring your mommy and have facial together or have a relaxing time with your significant other. Directions to Spa Elements ION: From level 1, take the lift next to Valentio and go to Basement 1. 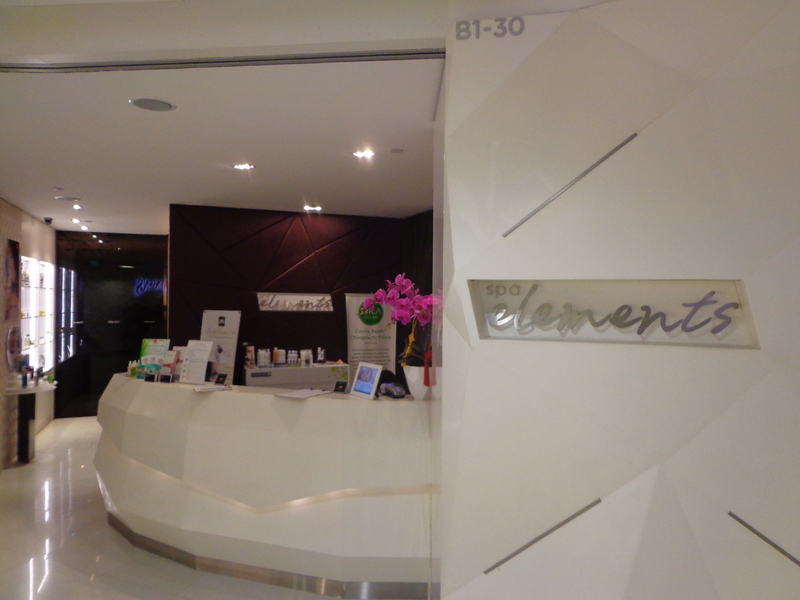 Spa Elements is located near Forever 21, Popeyes Chicken, Swensen’s above Orchard MRT Station. 4 sets of $30 ramen vouchers for giveaway! Treat your mommy dearest for free. Simply comment below and share what you will be doing for your mom on Mother’s Day. Remember to key in your email, Twitter / Instagram for me to contact you. Follow my Twitter or Instagram @MalcolmSunny, for extra $10 voucher if you win. Giveaway closes on 30 April 2014. I hate to begin my blog post on a negative note, but Singapore IS getting more expensive. These days most hotels have increased their room rates by more than 20%, some even doubled the price compared to few years ago. With real estate price continuing to climb, most tourist class hotels are offering rooms at min. $200 per room per night. As a member on Couchsurfing.org, I often get requests from overseas visitors asking if they can do a home-stay with me. But as I’m living still sponging under the roof of my folks, often I have to reject them and recommend some nice hostel choices for them. 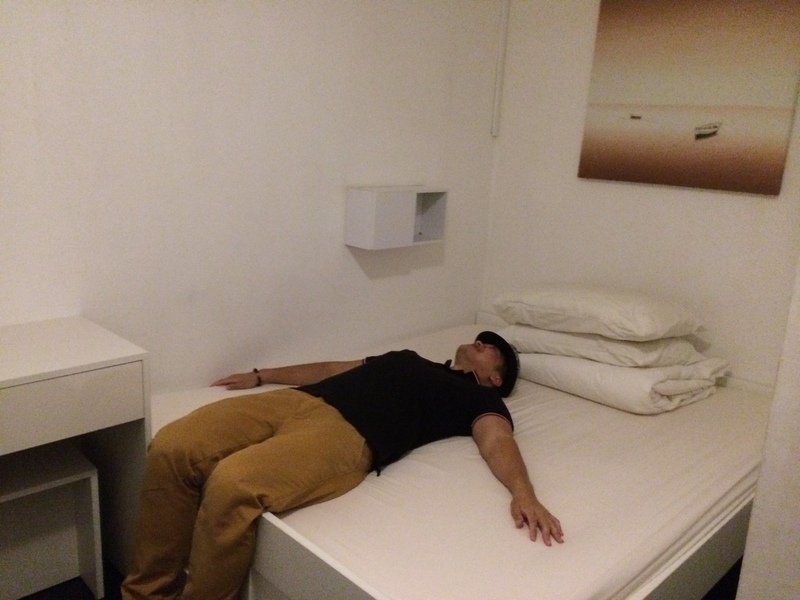 Located in the heart of downtown Singapore, Project Boat Quay is one of 5footway.inn‘s latest hostel. It’s only 5 minutes walk away to Raffles MRT station or 8 minutes walk to Clarke Quay MRT station. 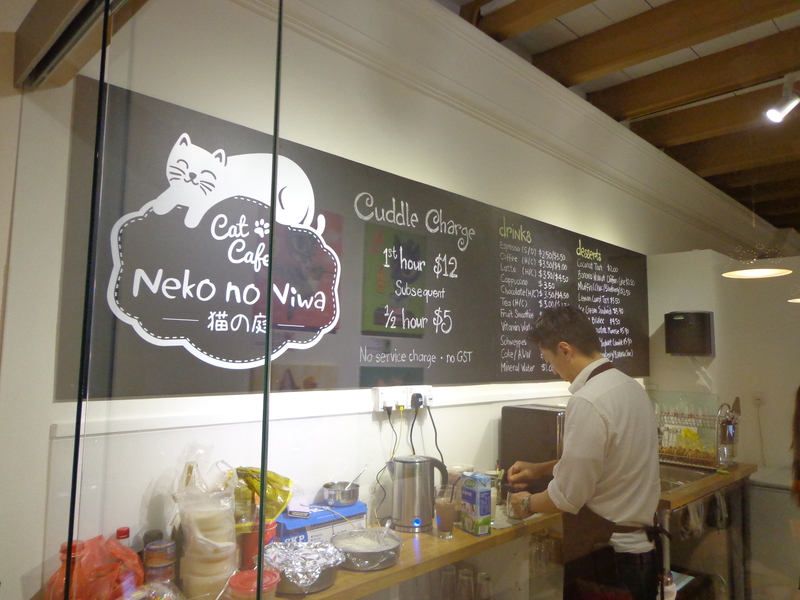 Neko no Niwa Cat Cafe, LONDON Bar, seafood restaurants, cafes, pubs, massage parlour, 24-hour convenient store, board games cafe and coffeeshops are all within 5 minutes radius. From its balcony, I can have a good view of Marina Bay Sands! Passing through the front door, Tiffany Yong and I are pleasantly surprised to find out that 5footway.inn Project Boat Quay is more than just a hostel. It is also an art gallery. 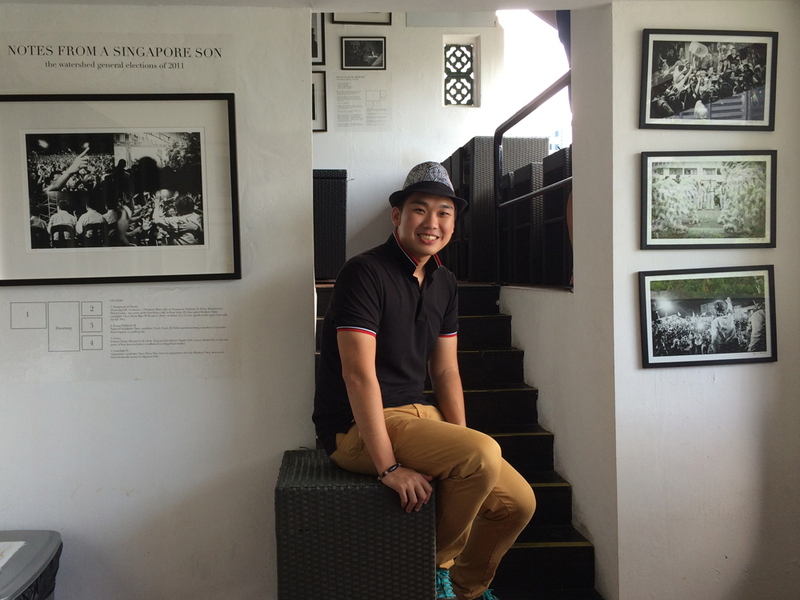 The team has collaborated with award-winning Singaporean photographer, Edwin Koo to install Gallery 76 into the common spaces of the hostel. The layout feels like a maze but there are proper signages to guide us. At the 3rd floor of this restored shophouse is The Terrace, a common area where there is a cosy TV lounge, alfresco dining area, pantry with refrigerator, water dispenser and microwave oven. There is even a hot beverage dispenser machine which you can make a cup of milo or teh tarik (hot tea) and enjoy a decent conversation. Breakfast is provided. Free flow toast and cereal are available for breakfast. Upon check-in, the staff leads us to our room. For this review, we are staying at a standard double room. We are given bath towels and a security card which allows as to access the main door, our room and also the lockers in the room. The whitewashed room is small but comfortable. Besides the bed, there is a side table, two lockers and a mirror. There are no TV or attached bathroom. 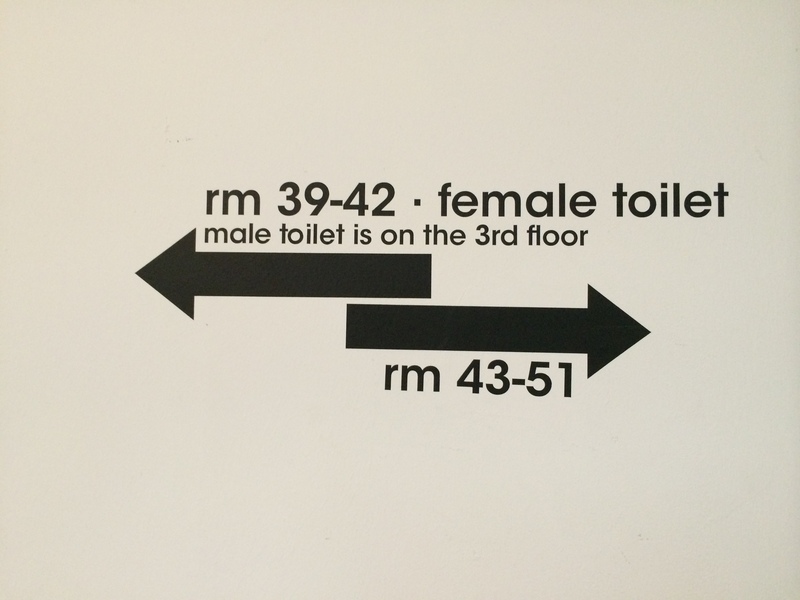 For guys, the shared bathroom is located at level 3, and Ladies is located at level 2. Shower gel and shampoo are provided in the shared bathroom. I’m glad that the cleaner takes pride in ensuring cleanliness of the toilets. Bearing in mind, it’s a hostel, they try their best to make up for what is lacking. Free high-speed WiFi is available throughout the spaces and I have no problem accessing internet from the comfort of my room or at The Terrace at level 3. There are also 3 sets of Mac desktop available in the reception area. 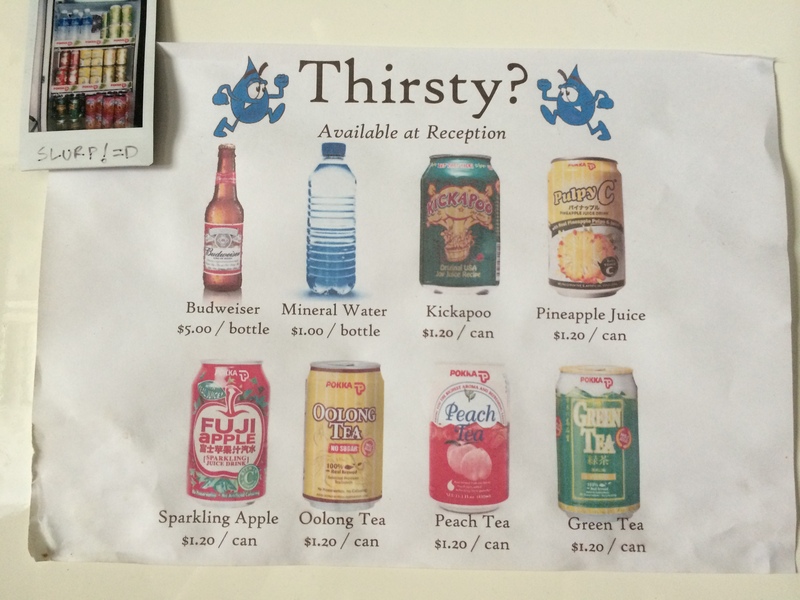 Cheap drinks and beer are available for purchase as well. They also provide laundry service at a small fee. At night, there is live music coming from the nearby bar but the sound doesn’t penetrate to my room. However, as there is no attached toilet, I can hear people closing doors and footsteps as people make their way to the washroom to relieve themselves. I am a light sleeper and old shophouses are not built to be soundproofed, hence it was difficult for me to get rest at night. But hostel culture is communal living, so one cannot expect hotel standard and service when one is only paying a fiction of price. Overall, it is good for a roof over your head. Project Boat Quay is located at 76 Boat Quay, Singapore 049864. Price starts from S$28 for mixed dorm. Visit their website or Facebook for more information and booking. Started in September 2011, 5footway.inn is currently the largest hostel chain in Singapore with over 700 beds in 4 outlets located at key tourist heritage districts in Chinatown, Kampong Glam and Boat Quay. Opened in May 2013, Project Boat Quay is the newest and largest property. Situated along the Singapore River, facing the Parliament House and Asian Civilization Museum, it is a few minutes walk from the legendary Fullerton Hotel, Lau Pa Sat, Merlion Park, the Esplanade and Chinatown. I’m proud to be a Singaporean and I hate to admit defeated to our cousin from The Straits Settlement – Penang has once again been voted as the no. 1 haven for street food in Asia. Lonely Planet names Penang the top culinary spot for 2014. Fellow foodies embarked on this gastronomical journey with me as I explore Pulau Pinang with my tummy. 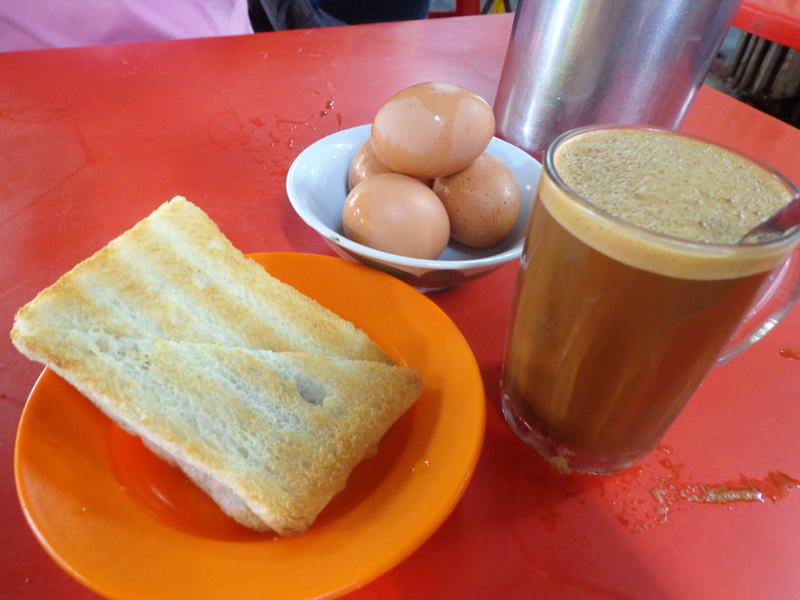 This blog post will be a recollection of my recent trip to the island, covering the popular Penang street food – Chicken Rice, Char Kway Teow, Assam Laksa, Chee Cheong Fun, Hokkien Mee, as well as cool cafes and restaurants around Georgetown and near Gurney Drive. I was with my friend, a Malaysian who grew up in Penang. He had spent years working overseas and we’re on this trip to visit his parents and to re-discover Penang. The best way to travel Penang is self-drive. We got our car from Big Thumb car rental. The next best option would be to rent bicycles. But Penang, being much bigger than Malacca, means that you can only cover limited places on two wheels. It was lunch time and we’re on the hunt for food when we came across Fatty Loh’s chicken rice shop. My friend recommended it since it was a famous spot for tourist. To be honest, I never thought that Penang could be famous for chicken rice. And I wasn’t too wrong about it. We ordered a plate of Steamed Chicken (for 2 pax), BBQ Pork (char siew as commonly called in Singapore), a bowl of Peanut & Pork Soup and 2 cups of Longgan Tangkuah (longan & winter melon) drink for RM22. We were also served a complimentary small plate of fried pork chop. The food was good but not excellent. I was reading this Time Out review and realised that if I would have ordered their roasted chicken with rice, I would probably have given them more points. What I loved was the feeling of dining in a museum at Fatty Loh’s. The place was like a warehouse of antiques and artifacts. 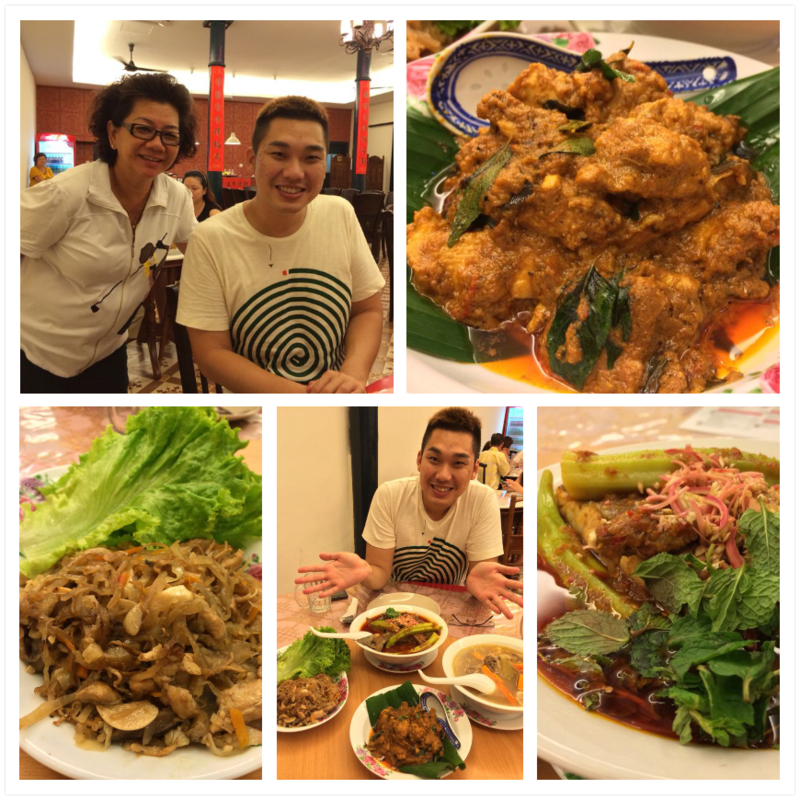 This was my 3rd trip to Penang, and it turned out to be a food hunt every time. 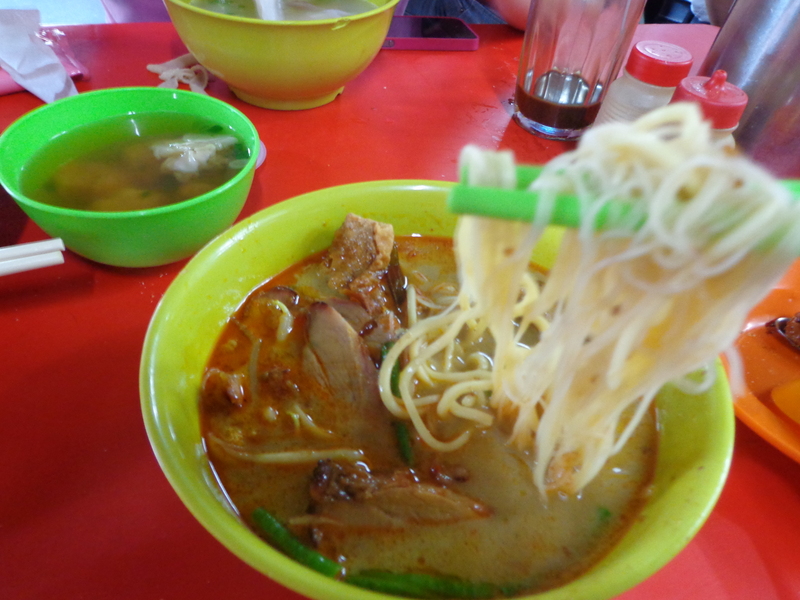 After our meal at Fatty Loh’s, my friend drove us to his favorite Assam Laksa stall. Guess what, this coffeeshop even have their own Facebook page! 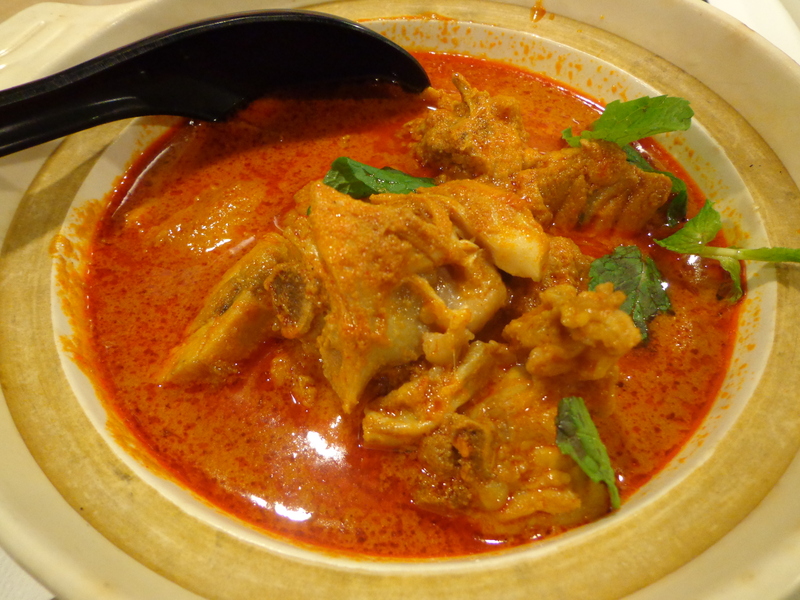 As we had just finished eating at Fatty Loh’s, we ordered the Assam Laksa without noodles. According to a Malaysia food website, this Assam Laksa is somewhat different in taste as it’s cooked with tamarind juice instead of tamarind peels. We ordered one large bowl and one small bowl and it costed RM8.50. 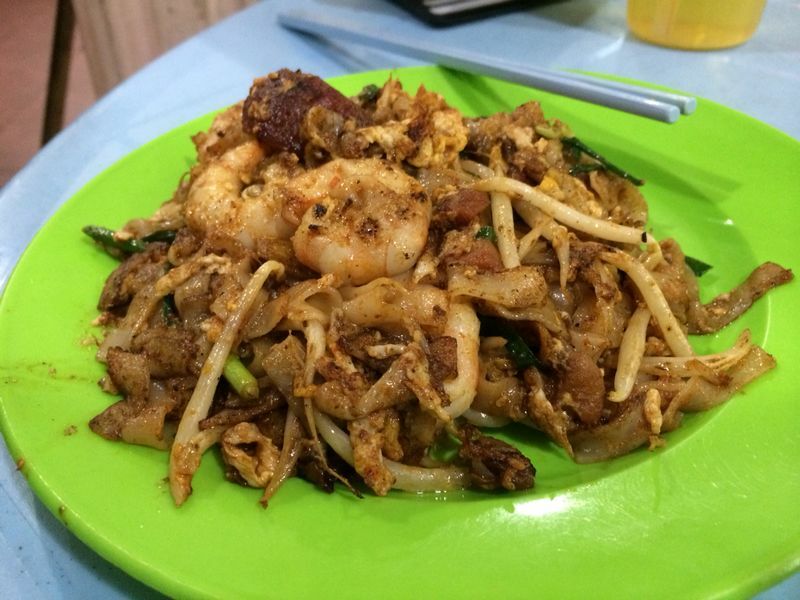 This coffeeshop is also well-known for their Char Kway Teow. We headed back to our hotel for a short rest before driving to Kafe Goodall for dinner. There are a few Goodall Food Court, we went to the one opposite the famous Penang Chinese Girls’ School. What is highly recommend is the Chicken Satay. Unlike the ones I tried in Singapore, this one was specially tender and the chicken bits were chunkier. 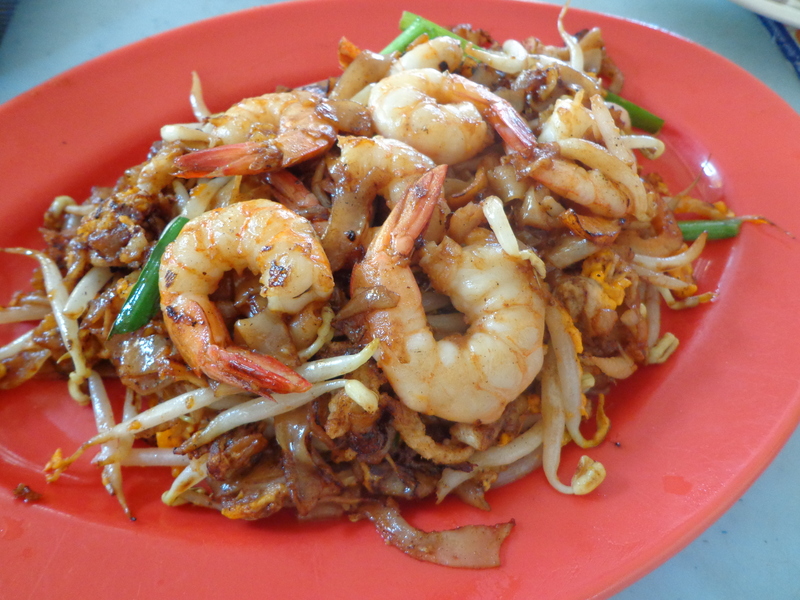 We also had Char Kway Teow, Hokkien Mee and Char Hor Fun to share among four of us. Something unique about the Hokkien Mee and Char Hor Fun (we simply called it Hor Fun in Singapore) is that they mixed bee hoon (rice vermicelli) with the noodles. Naturally the bee hoon would soaked up the gravy making the taste more wholesome. 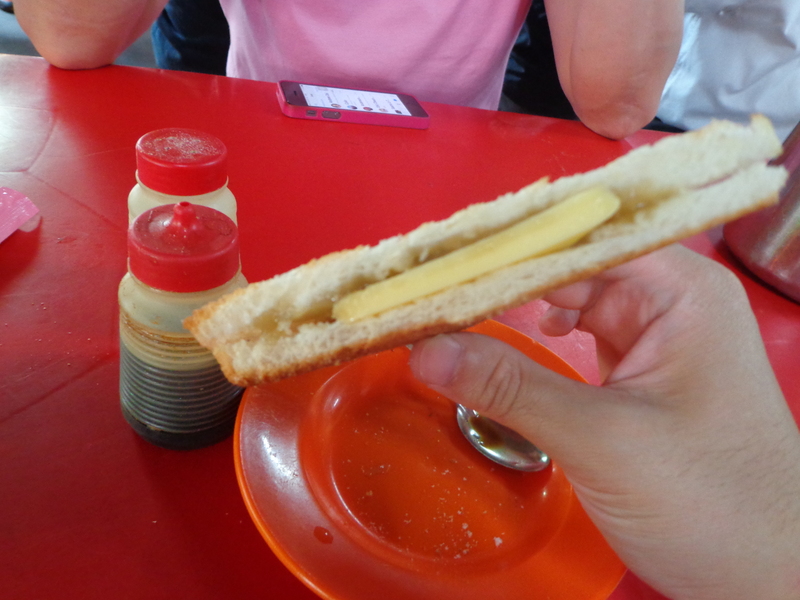 Here’s a secret you need to know – Penangites don’t eat lunch. Most street food places are open for business only at night. 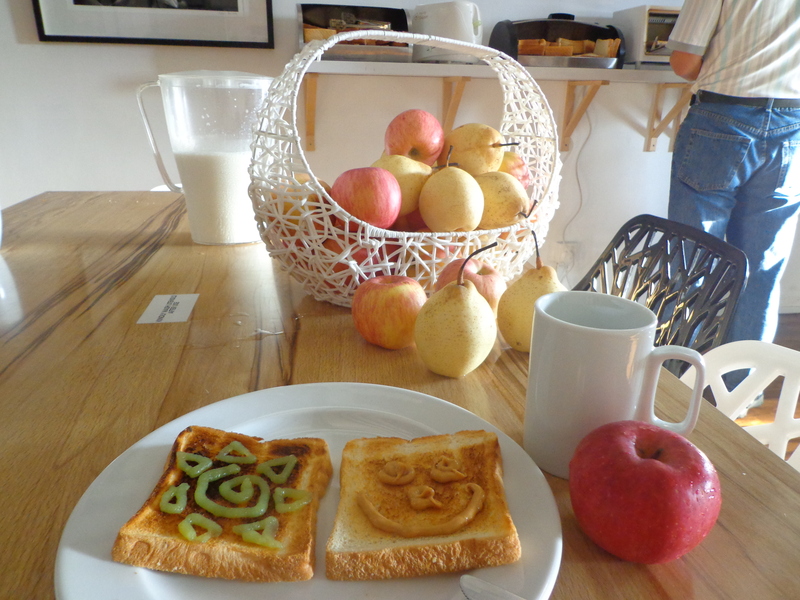 And you can also find a lot of good places for breakfast. But when it comes to noon, a lot of food places are closed. A stone throw away from Kafe Goodall is Taman Emas Kopitiam, this place closes on Monday so please plan your itinerary properly. The Assam Laksa here is famous and extremely popular on weekends. 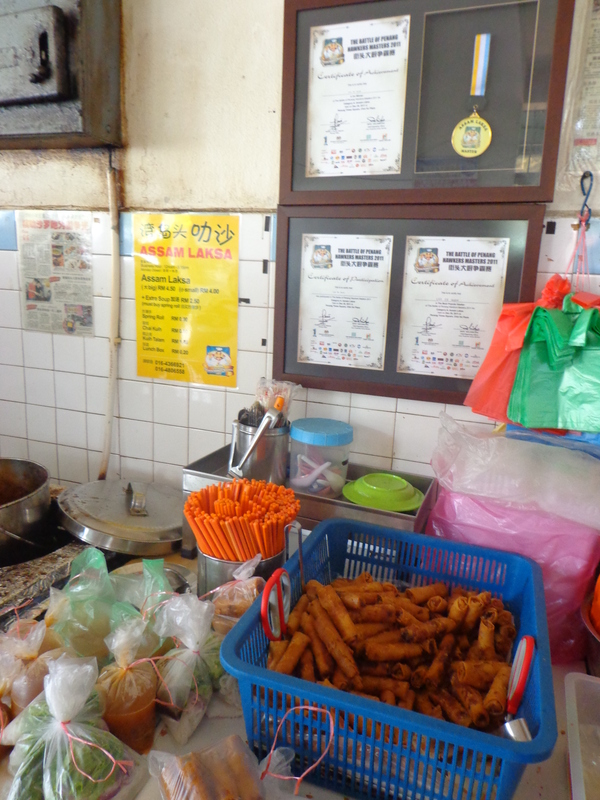 It has also won northern Malaysia best hawker award in 2011. 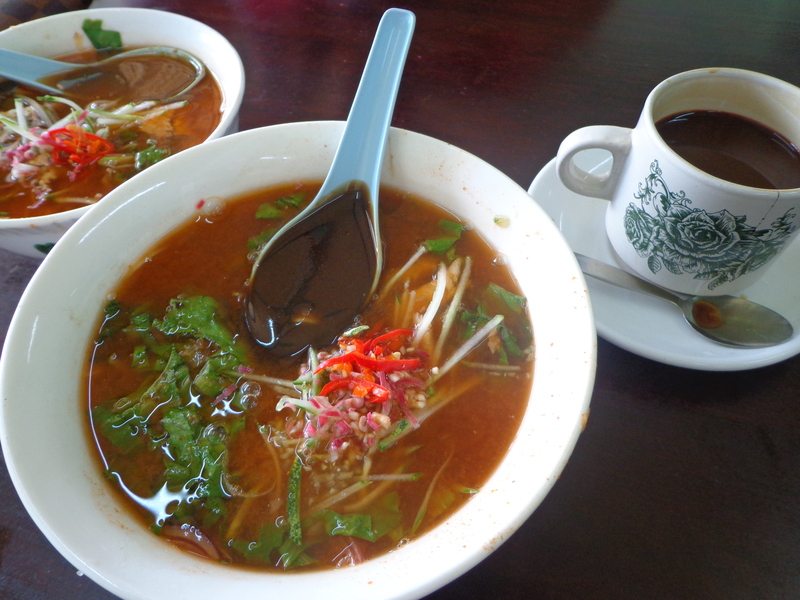 The broth is made from fresh fish meat blended into the assam soup. Remember to order the popiah to complement the broth. 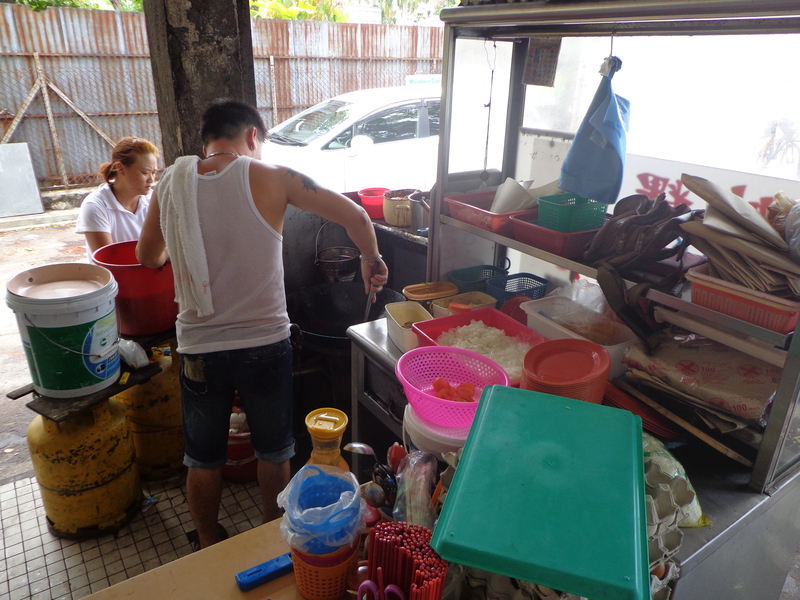 The locals will dip the popiah into the broth. In my opinion, this is the best Assam Laksa I had tried in Penang, it was better than the famous Assam Laksa at the foothill of Kek Lok Si temple. 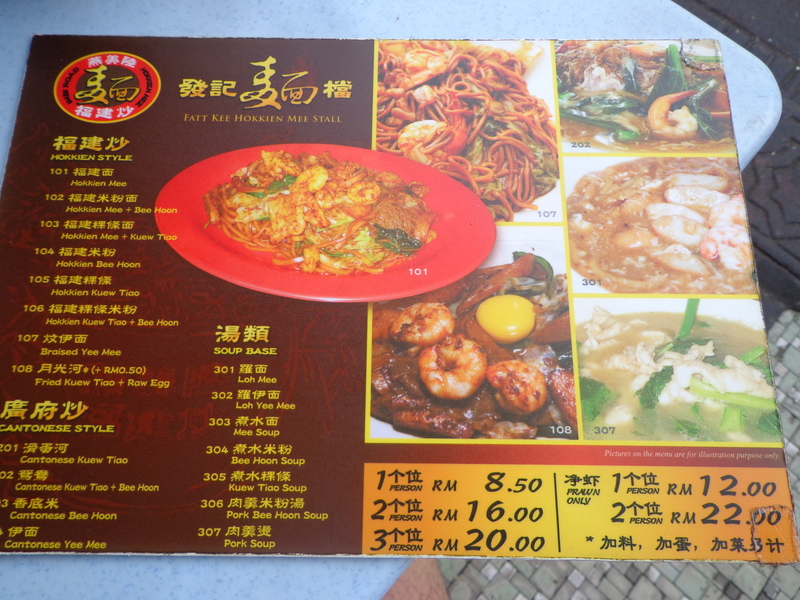 We also managed to try the Char Kway Teow and Chee Cheong Fun there. 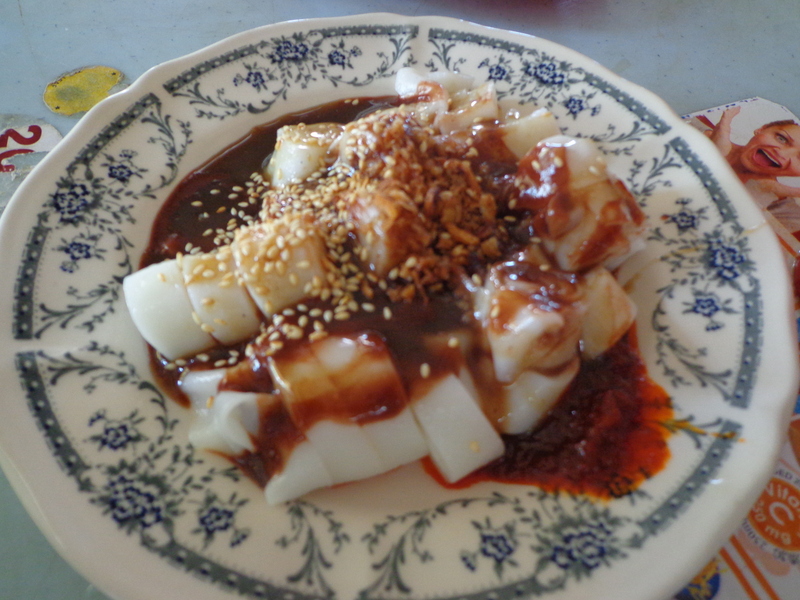 The Chee Cheong Fun was really soft and it simply melted in my mouth. I gave a double thumbs up for this. I wonder why I haven’t been to this place earlier. Chinahouse is one of those places whose charms captivate you to keep beckoning back for more. 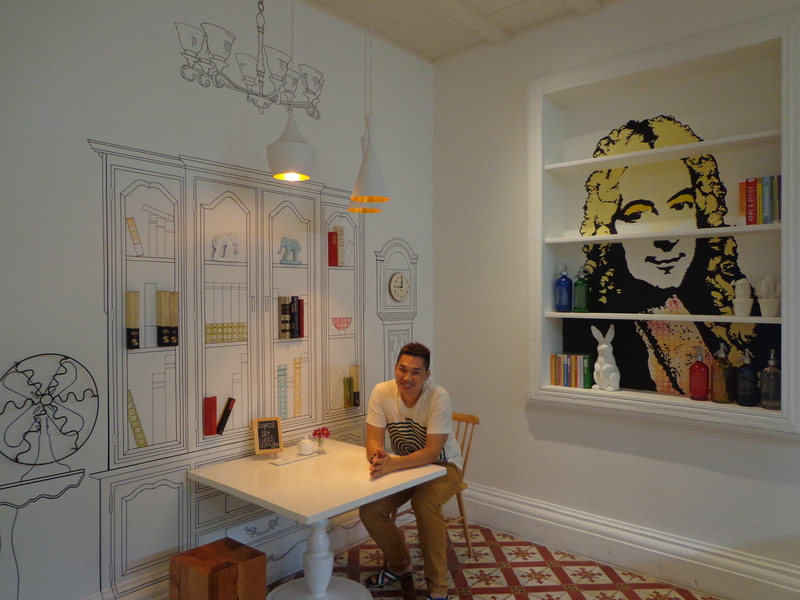 Lonely Planet said it’s Penang’s best.. Cake-tastic cafe, restaurant and bar complex spanning a whole block. Chinahouse is a mammoth of 3 heritage buildings situated right in the middle of the core zone of Georgetown. Enter from either Beach Street or Victoria Street and you will be greeted with 14 unique spaces comprising of souvenir shop, cafe, restaurant, art gallery, live music and bakery all round into one. 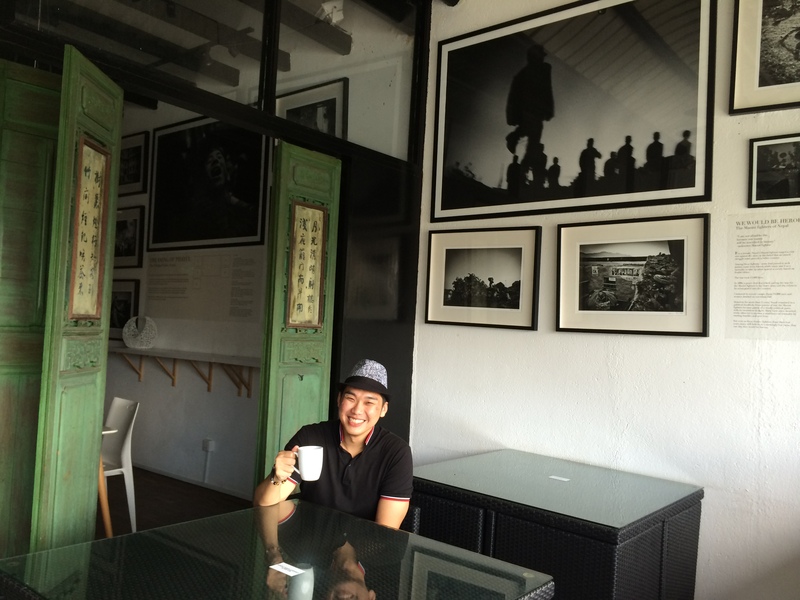 This longest cafe in Penang is the perfect example of how Georgetown has moved on with time. Chinahouse is modeled on a lane way concept with one path from Beach Street to Victoria Street, while some outlets go off this lane, the lane passes through others. This juxtaposed cafe provided free wifi and paper with crayons for you to doodle on the table tops. Some of the artworks by patrons turn into display in their street gallery. We’re there the after diner night before and we love it so much that we returned the next day for afternoon. I had a pot of Lemon Ginger Mint tea (RM12) and my friend tried their Blueberry Mango Coconut Smoothies. The place gets crowded every night, so for better service, come when there’s daylight. By day, The Canteen serves the best Bento Box, a mix of Western and Asian flavours – a rice-based menu with tasty mains and morsels. Don’t miss out on Comedy Night every first Thursday night of the month! On Saturday, the bakery (on the left) sells an average of 450 slices of cake. The bakery is 10 chefs-strong, and they have to try out 10 new recipes a week (if they don’t try new recipes a week, they get fired). Pardon my ridiculous expression as I’m mesmerized by this poolside dining concept of the Courtyard Cafe. Order and pay from the different cafes / restaurants inside and bring your food out to enjoy the breeze under these lucky trees. Vine and Single offers a tasting of 8 different red wines by the glass. The best cocktails in town at Mr. B’s Martini Bar – the popular choices are mojitos, margaritas and long island teas. 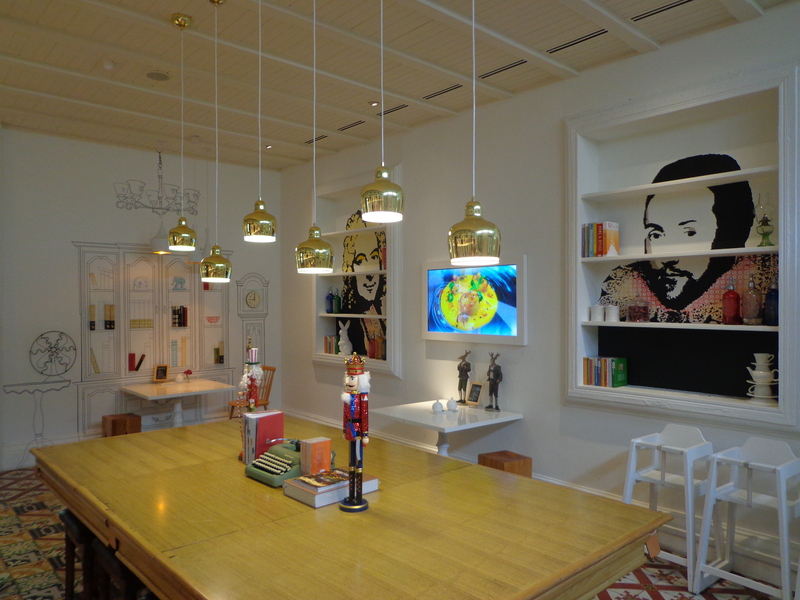 Reading Room offers a space for talk-fest with friends. Or simply grab the books from the shelves for a quiet afternoon. The owners also encourage you to “accidentally-on-purpose” leave your books behind to become inspiration for others. 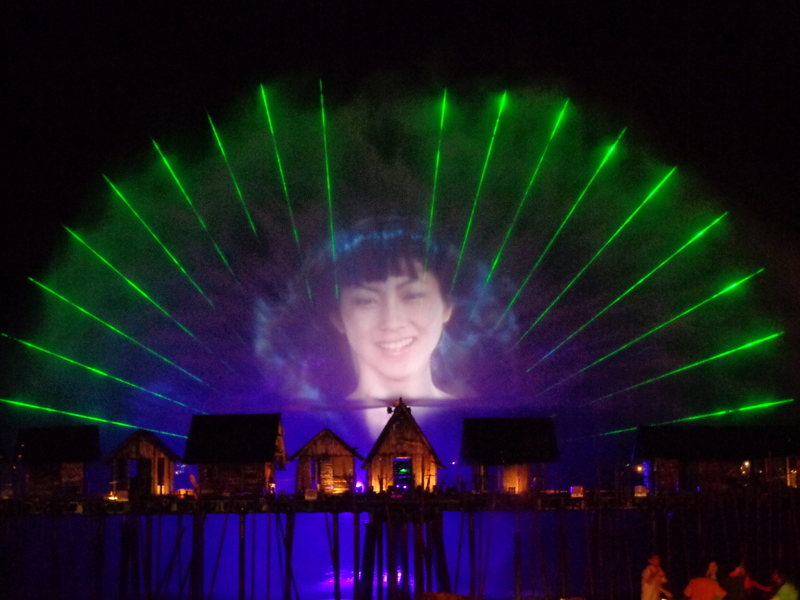 Chinahouse aims to be an arts platform supported by interesting other concepts. Besides Art Spaces in 153 & 155 Beach Street, and performance at The Canteen, feel free to art-jam on their table tops. Baked fresh daily – Chef Jo Jie and her team of 10 talented bakers serve up delicious cakes, brownies, tortes, slices, biscuits, breads and pies to suit any craving. Located along the historic Macalister Road and designed around the idea of an old English Mansion, this beautifully restored boutique hotel offers 8 unique rooms for comfort accommodation. 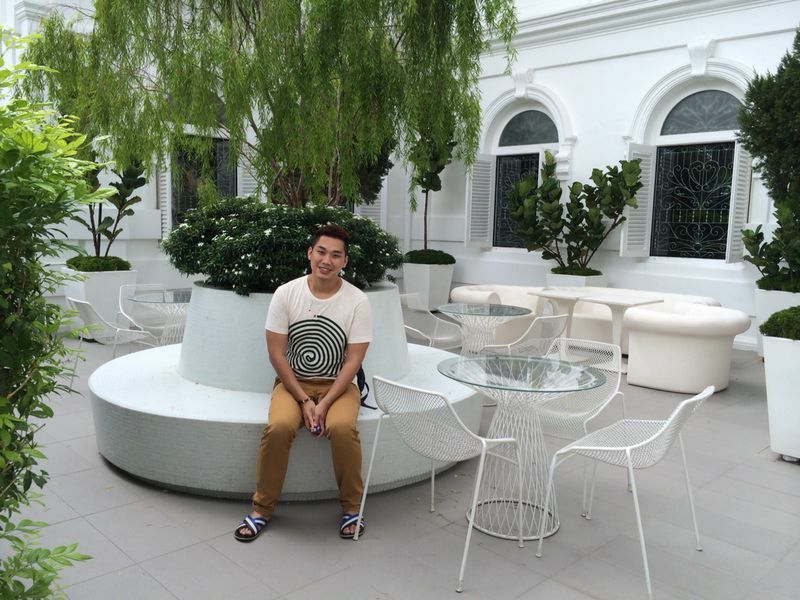 Even if you’re not staying there, Macalister Mansion offers 5 venues to relax and unwind. We checked-in to The Living Room for afternoon tea. The afternoon tea set for 2 with TWG tea costs only RM69, available from 3-6pm. Built around and inspired by the former St. Joseph’s Novitiate, the relatively new mall along the promenade features stylish restaurants and cafes, and a good place for shopping. We spent our afternoon indulging sinful sweets like the Famous French Toast (RM16.80), Vanilla Souffle (RM16.80), Matcha Parfait (RM16.80) with Matcha Latte (RM10.80) and hot tea at Miam Miam. It’s a good dessert place but if you prefer coffee, then head over to Ben’s which in also located within St Jo’s. I was craving for contemporary Peranakan food and my friend suggested heading over to Plaza Gurney’s Basement 1 for The Little Nyonya Cuisine. 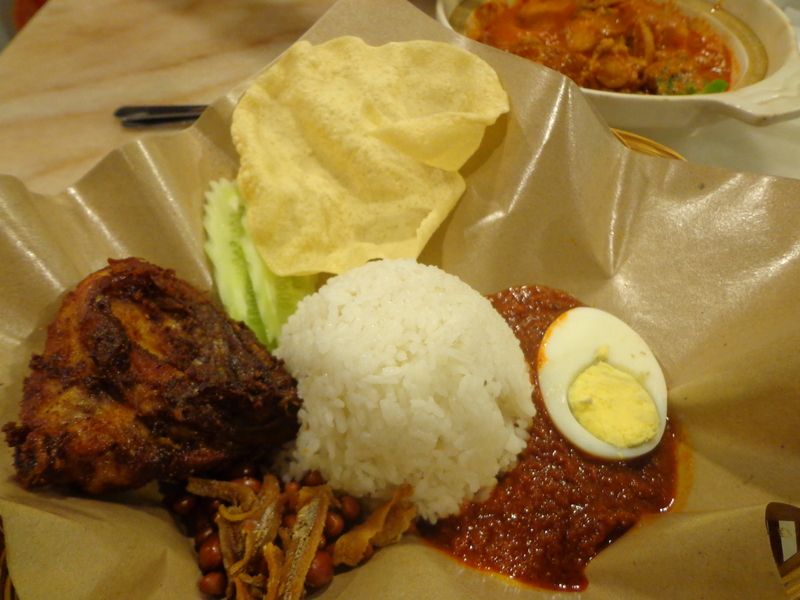 Previously I had been to The Little Nyonya restaurant located at Queensbay Mall, and being rushed for time, we ordered two sets of Nasi Lemak Special (RM17.60 each) and Nyanya Curry Chicken (RM15) for sharing. 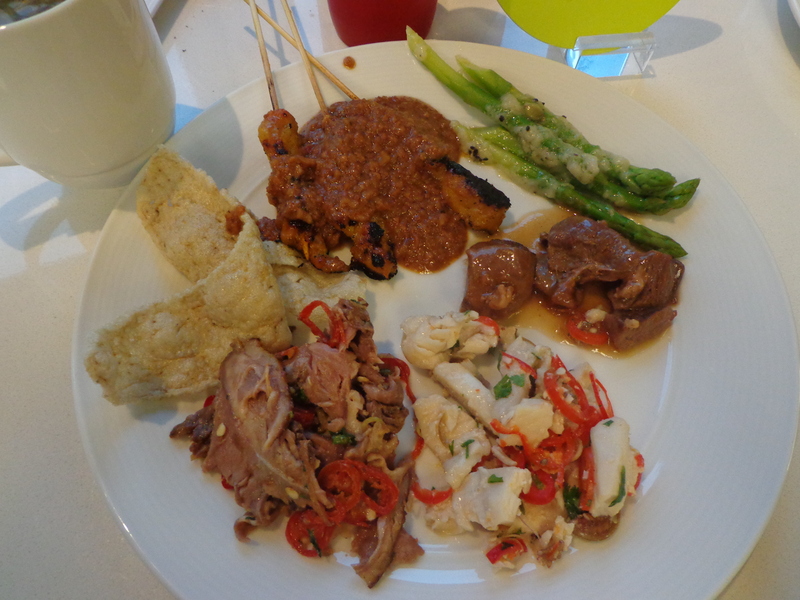 The food is good if you’re not a fussy eater who likes home-cooked style Peranakan food. 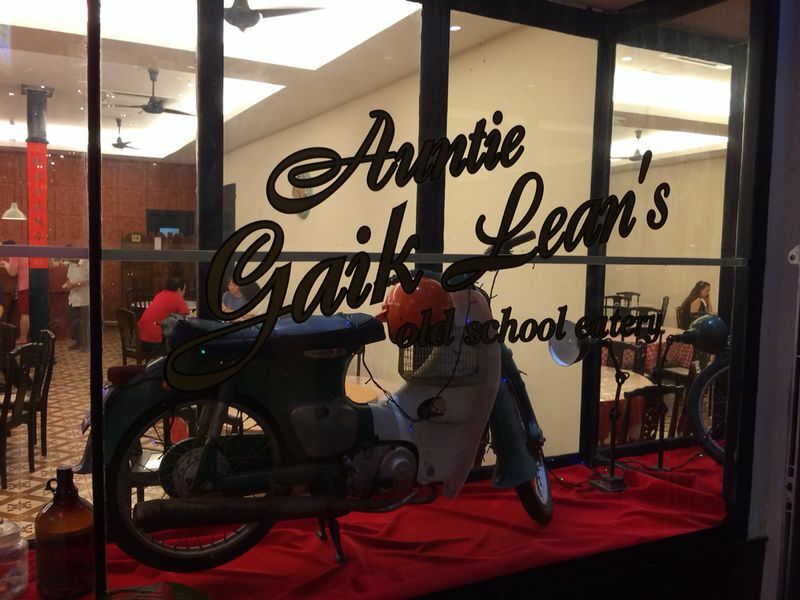 For dinner, my friend brought us to Auntie Gaik Lean’s old school eatery. 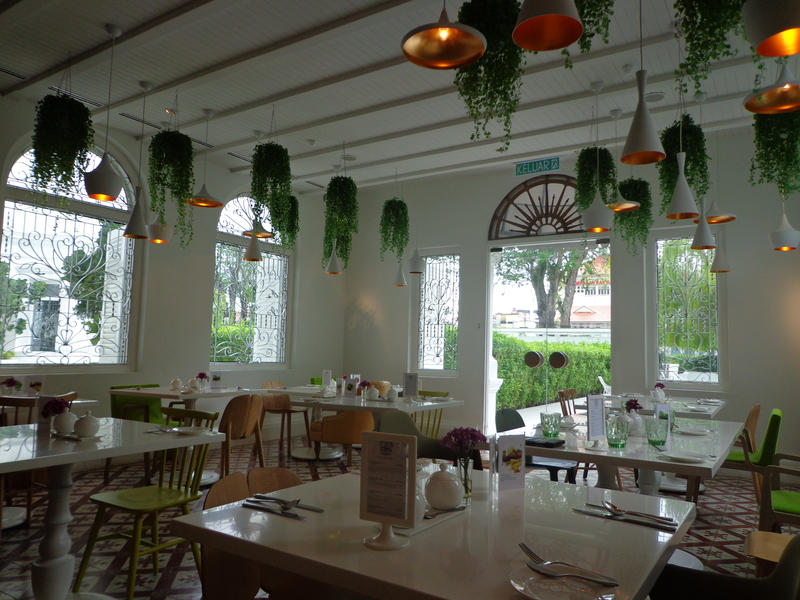 This quintessential decorated restaurant is the best kept foodie secret for Peranakan cuisine. It’s a pity that Auntie Gaik Lean is too busy stirring the woks in the kitchen and there was no official website or Facebook. This place relies on the age old word-of-mouth marketing and the various media exposures to spread the word, but it is always full house on weekends. 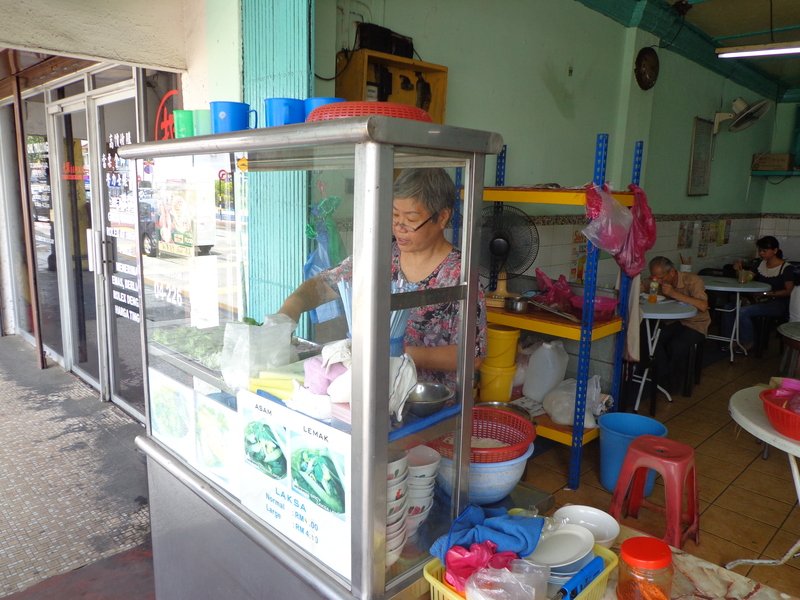 Located right in the core zone of Georgetown, Auntie Gaik Lean explained to us that Penang’s Peranakan food is very different from Malacca, as the latter is influenced heavily by the Portuguese culture. 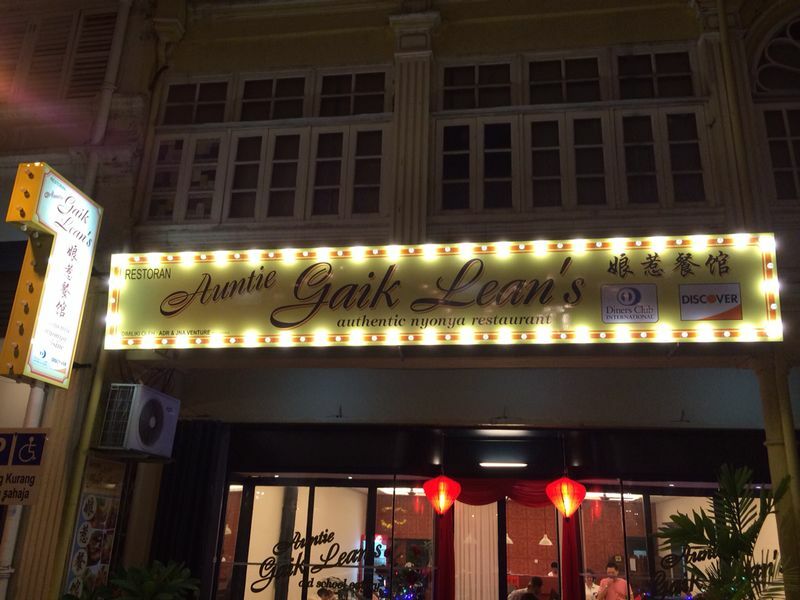 Having been to Nancy’s Kitchen in Melaka, I would definitely give Auntie Gaik Lean double thumbs up. On our table top that night was Nyonya Chicken Rendang (RM25) – dry curry chicken with coconut milk, Gulai Tumis (depending on market price) – tamarind fish curry served with ladies fingers, Jiew Hu Char (RM22/32) – traditional nyonya mixed julienne vegetables & shredded dried cuttle fish serve with lettuce. My favorite dish would be Jiew Hu Char. Scoop a spoonful of shredded dried cuttle fish onto the lettuce and wrap it be like a spring roll – it’s crisp, fragrant, and simply delicious. 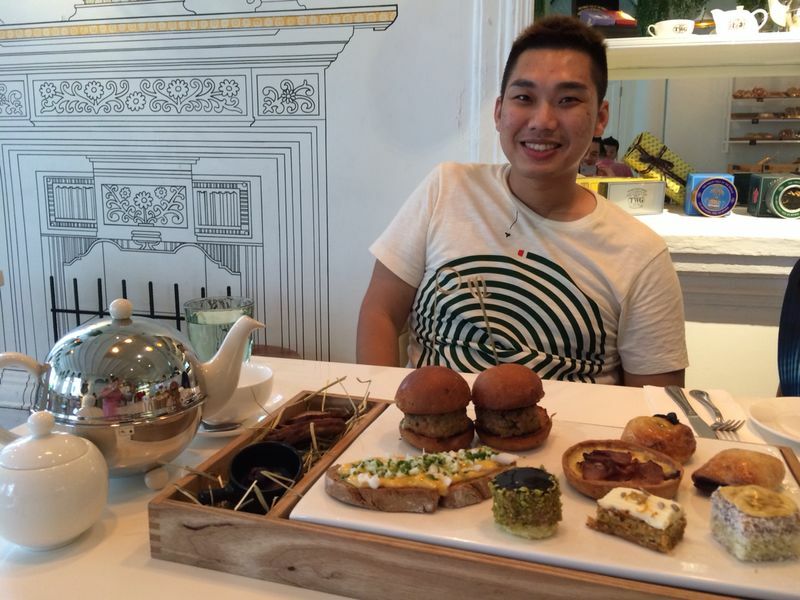 What are some of your favorite places for food or afternoon tea in Penang? Please share and comment below to let me know. Follow my Twitter and Instagram @MalcolmSunny for more travel and food reviews. I want to begin this blog post with a beautiful quote from Renaissance Hotel, “No matter where or why you travel, there’s always something wonderfully new to be found”. This sums up my travel experience in Johor recently. Under the invitation by Visit Malaysia 2014 to explore Johor, I’m honoured to experience two different types of accommodation across the causeway. Launched in May 2013, this chic and spacious property boasts of its 345 modern contemporary rooms and 5-star service. Located near the industrial town, Pasir Gudang, RENAISSANCE is the lifestyle brand under Marriot International. When I enter the hotel, I’m greeted by a grand lobby. A short walk up level 2, there are several function rooms for meeting and seminar. The hotel has also set aside a lounge area with a mini bar at level 2 for guests to mingle and network during the seminar breaks. Our tour continues to the Club Floor, where a lavish display of tapas is on offer. From the Club’s balcony, I can see the Straits of Johor, Senoko Power Station and Woodlands Industrial Park. My Malaysian media friends jokingly said that I’ve not really left my island. We move on to view the Presidential Suite before returning back to our own rooms to freshen up before dinner. Are you planning for a romantic night with your partner? The hotel is not short of recreational and entertainment facilities. The swimming pool and sauna opens from 6.30am to 9.30pm daily. There’s also 24-hour gym centre at level 6 besides the swimming pool. To encourage healthy living, Renaissance Johor Bahru Hotel offers a gym membership at RM2,1oo nett per year, includes 20% discount on all F&B outlets in the hotel, complimentary car parking, usage of swimming pool & sauna, and access to 24-hour gym. Need an excuse to exercise? A fully equipped gym with lots of cardio machines. Come on, work it, work it! Bird’s eye view of the swimming pools from clubhouse. Sunset by the pool. It was raining heavily when I was there. After a quick shower, it’s time to indulge in indigenous dining at Cafe BLD. This all-day dining restaurant of the hotel serves local and fusion cuisine with international live cooking buffet. 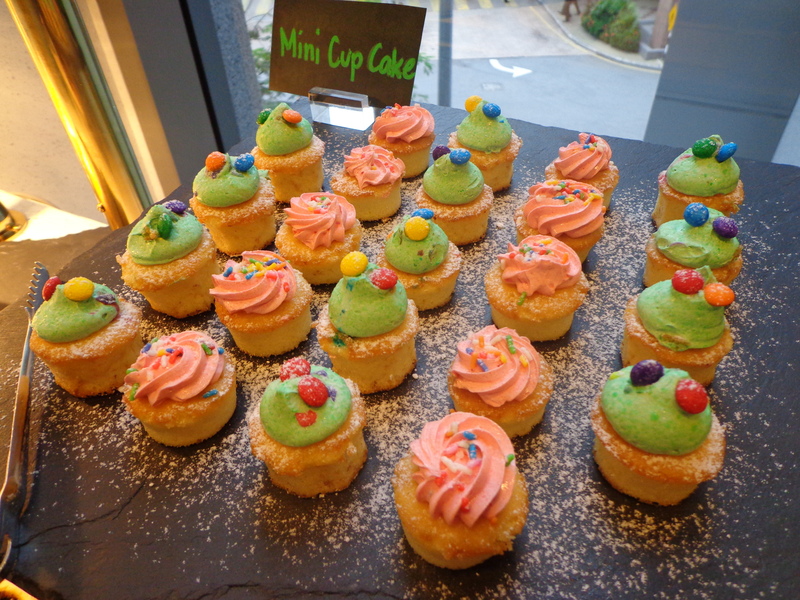 Breakfast buffet is at RM42++ per person, lunch is between RM55 to RM60++, and dinner at RM68-RM80++. For those who crave for Chinese food, Wan Li Restaurant is located across the lobby from Cafe BLD. Both common dining area and private rooms are available for reservation. Wan Li Restaurant serves authentic chinese cuisine with assortment of dim sum delights from late morning to afternoon 3-pm. Wedding package from RM1399++ per table onwards. Tired after a few day of meeting and conference? Rewind at RBar with RLife Live – live music from the resident DJ. Enjoy intriguing drinks with Happy Hour from 4pm to 8pm. And the best deal? They serve premier wine by glass! Cafe BLD – I have never seen so much sashimi in my life before! 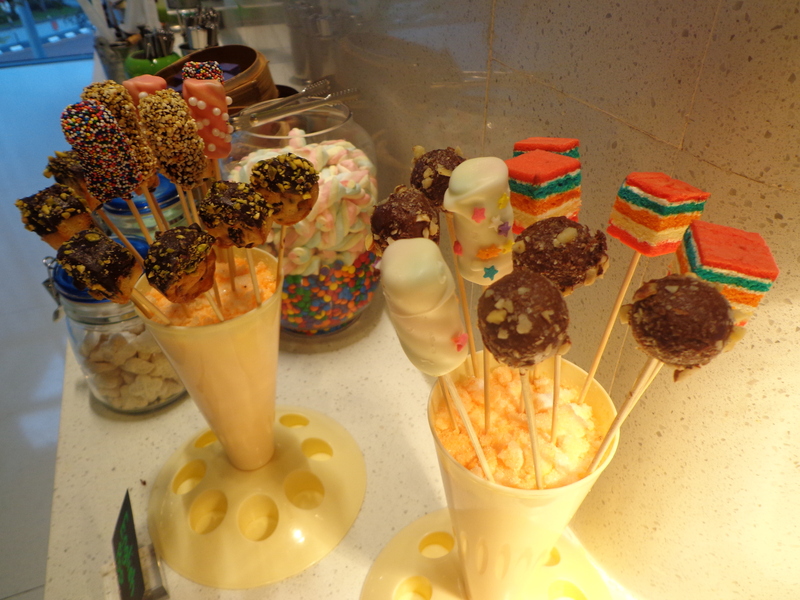 Cafe BLD – And their desserts are really good too. Wan Li Restaurant – I wonder if those fishes are edible too? Wan Li Restaurant – There was a Ultimate Dim Sum Challenge when we were there. Finish 18 baskets of dim sum in 30 minutes and get the meal free. Wan Li Restaurant – They have private rooms for small wedding reception or better still book the entire restaurant for your wedding. Corporate room rate starts from RM 285 per room per night. Walk-in rate subject to change, please check their website or get more info at Marriott.com. Converted from a private property, Bayu Marina Resort is a tourist class service apartment. Located in a quiet neighbourhood, it is “your far away home”. What I love is the free WiFi access, and accessibility to amenities within 8km include food establishments, shopping centre, karaoke lounge, massage centre, cinema and even bowling centre. The rooms are spacious, decorated in simple home-styling. Those long-term guests will appreciate the pantry area where they can prepare home-cooked meals. The hotel has six large banquet rooms which are ideal for corporate retreats, workshops, church seminars, etc. Breakfast is included in the package. 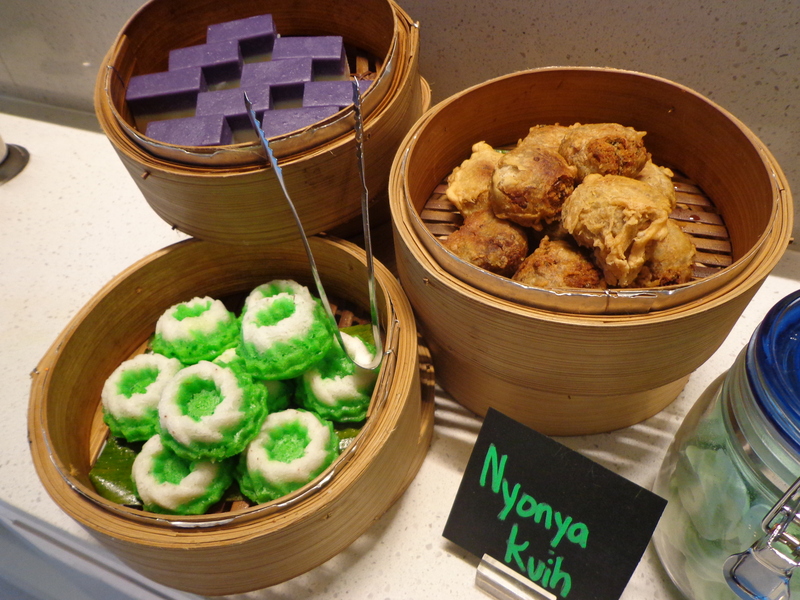 In the morning the cafe serves porridge, dim sum, nasi lemak and other local delights. For relaxation, simply change and jump in to enjoy the swimming pool with a view. Studio Room – We stayed at a Studio Room, it’s big and spacious. Twin-sharing with double bed. The rooms are similar in design. Room rates start from RM228 per room per night for studio room, includes breakfast for 2. Special thanks to Gaya Travel and Tourism Malaysia for arranging Kembara Cuti-Cuti 1Malaysia Johor trip. Go to Visit Malaysia 2014 for more exciting holiday ideas. 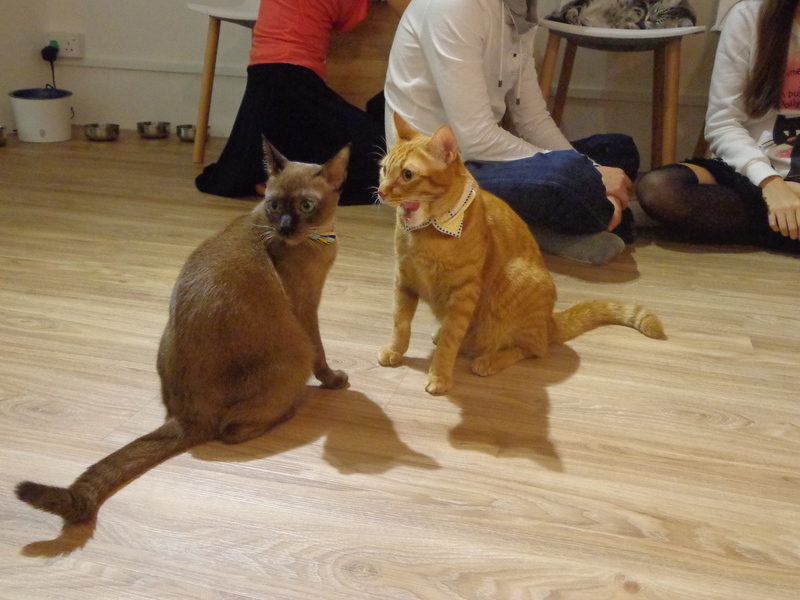 Since it’s opening in December 2013, Neko no Niwa or popularly known as Cat Café Singapore, has attracted a lot of buzz. Curiosity kills the cat, which is why we decided to venture for feline therapy on a weekday night. Centrally located in downtown Singapore along Boat Quay stretch facing the river, the cafe has a long list of bookings (especially on weekends) and usually not possible for walk-ins. My advise is to make reservation at least two weeks prior and go on a weekday evening. 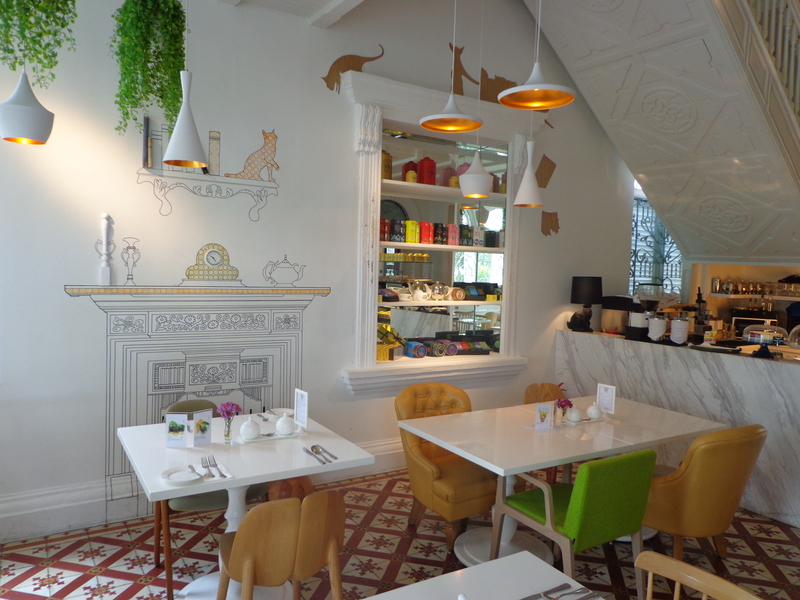 The cafe is divided into two areas – one for food and drinks, the other is a lounge area to interact with the cats. There is a cover charge or as they called it – a “cuddle fee” of $12 for the first hour. Subsequent charge is at $5 for every 30 minutes. 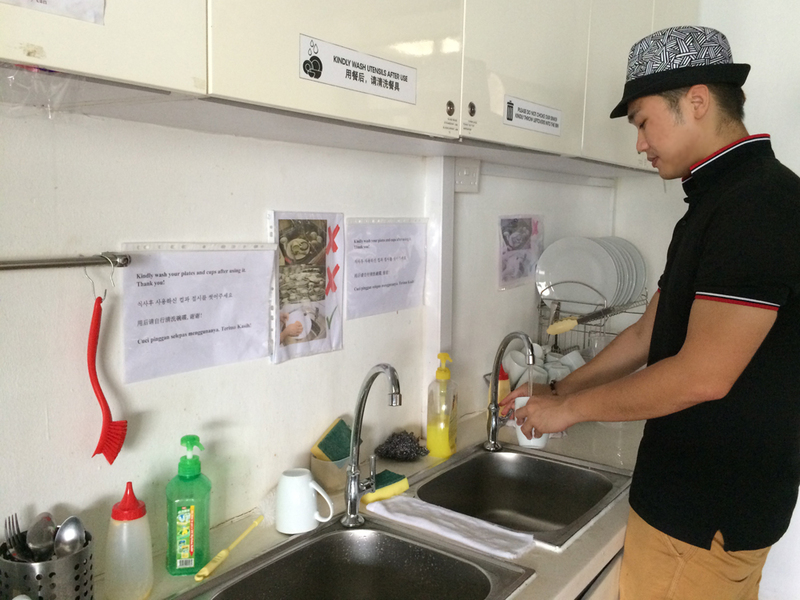 When you enter Neko no Niwa, the staff will direct you to sterilise your hands. After which, they will pass you a guide book follow by a short briefing. Basically they will highlight to you the 6 main rules, which are: No pulling of cat’s tail, No waking up of sleeping cats, No holding or hugging of cats, No flash photography, No cats are allowed to drink from your cup, No loud chats. For me personally, there wasn’t much opportunities for interactive with the cats. The cats there don’t like to be petted. There is a staff around who will warn you not to get too close to take photographs in case cats scratch you. I feel that they focus too much on safety and there’s the ‘Big Brother’ mentality that doesn’t treat us as mature adults that know how to handle cats. It’s not a bad thing though ‘cos Singaporeans tend to be difficult customers who complaints a lot. In contrast, there is no time limit. It’s true that cats need to get used to your human presence. Once they are comfortable, they will come to you. 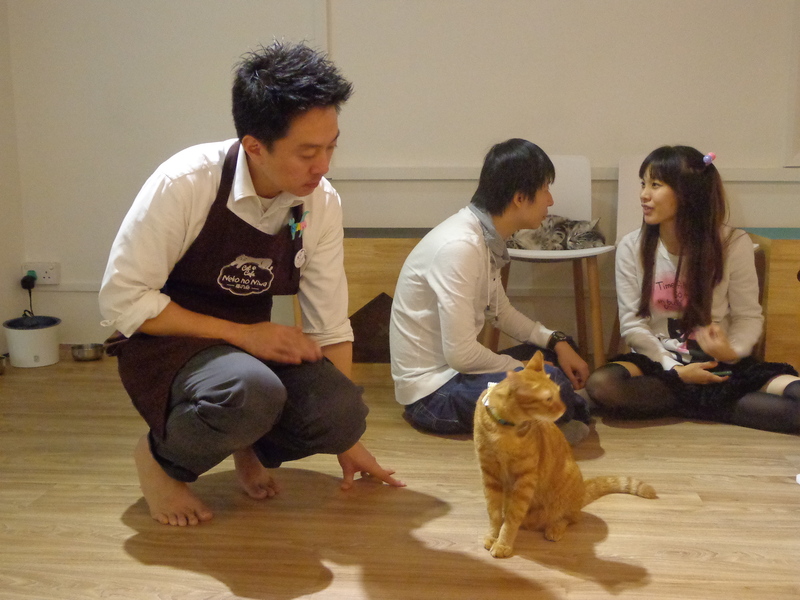 The cat cafes in Taiwan are also more spacious. 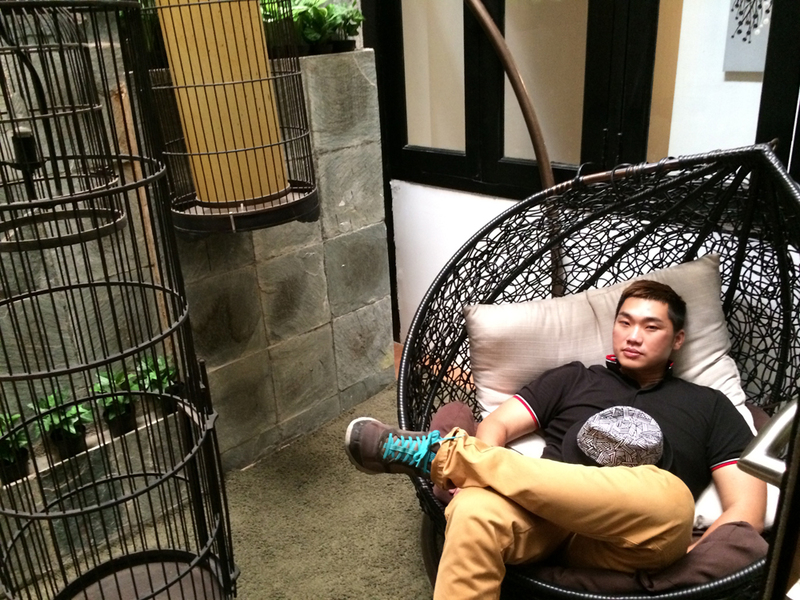 There are few benches and no space-consuming sofa. Most importantly they have several breeds of Pedigree cats. My other friend, Kate who had been to cat cafes in Korea, agreed with Ming Li, and added that, “There is minimal rule, just no flash photography. There is no one there to ‘guard’ you. Customers feel at ease and relax.” Ming Li said that the Taipei ones are better because there is no time limit, more trust (as no one is there to watch over you) and patrons are allowed to hug cats. 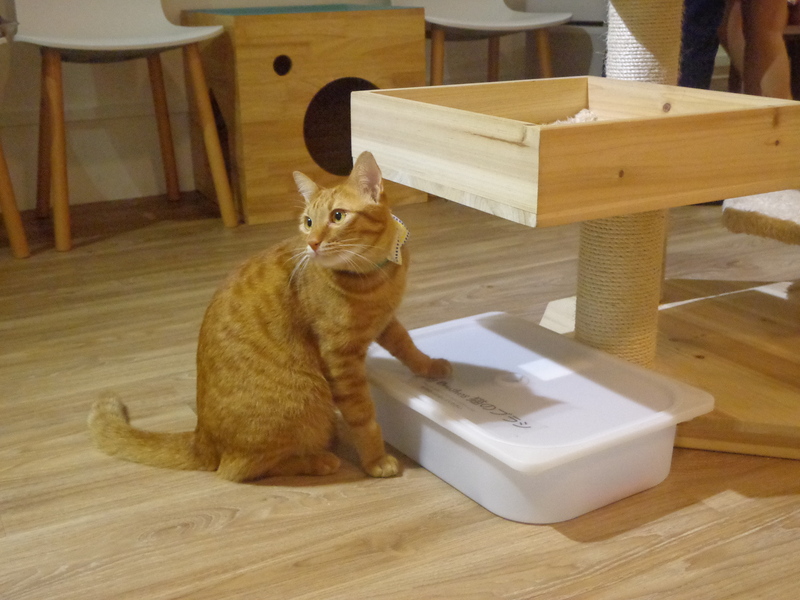 Perhaps the cat cafe in Singapore has just been newly set up and the cats there are still not used to being petted, so the staff are more cautious and safety is always a main concern in this republic. As a paying customer, I don’t agree with the time limit rule and feel that the place is too small. But as a business, they need to make money, and retail leasing in Singapore is high, so it’s understandable. I hope that can consider a second outlet in the heartland and charge a lower rate. 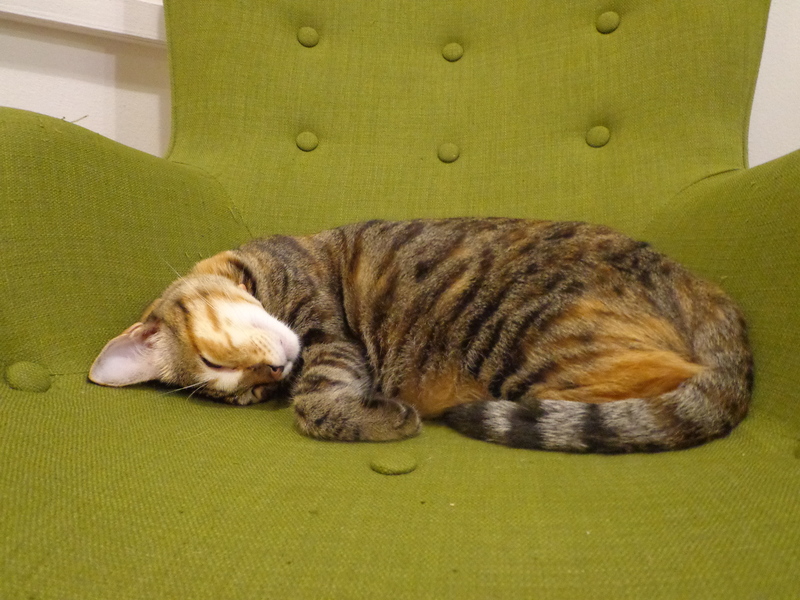 Generally, I enjoy the cosy feel of the place as if I am at the living room of a friend’s house who own cats. My two cents worth is this: Go only if you are a cat lover. But even as a cat lover, I feel that $12 for an hour is pricey, and you don’t get much interaction as the cats are either shy or aloof. I would rather spend the money on cat food to feed strays below my block. 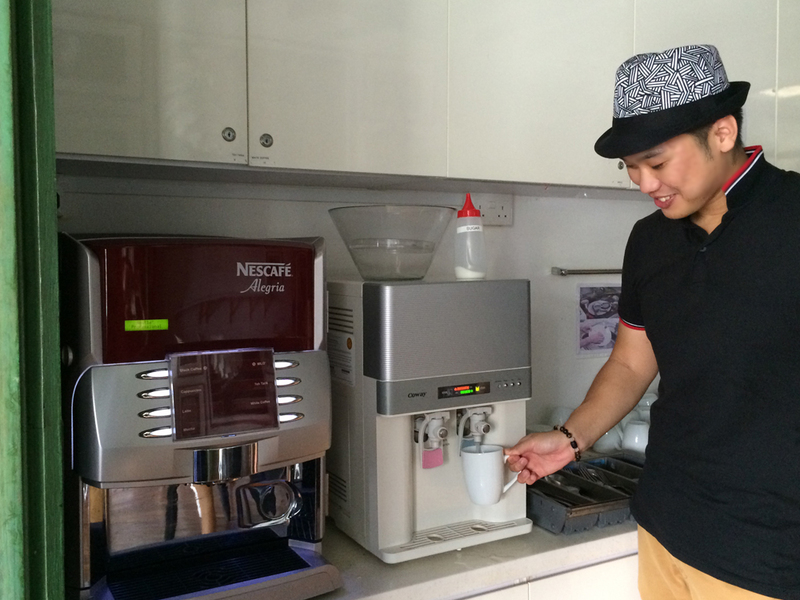 Neko no Niwa is located at 54A Boat Quay (level 2, river-facing side), Singapore 049843. Reservation is recommended and you can ring them at (+65) 6536 5319. Check out their website on the opening hours and their Facebook for updates. Cuddle fee : $12 for 1st hour, $5 for subsequent 30 mins there after. No service charge for food & drinks. Cash payment only. 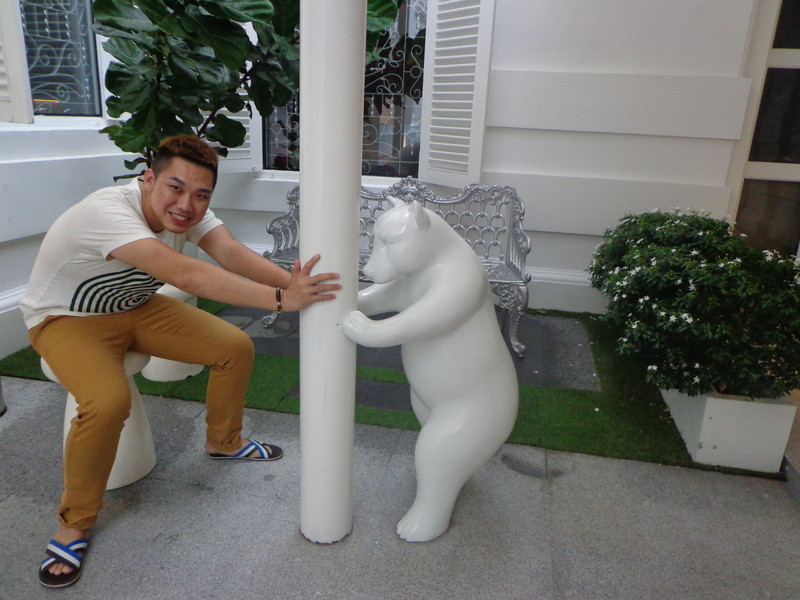 SPCA Singapore – they have a cat area there you can go in and interact with cats, for free. Noah’s Ark Natural Animal Sanctuary (NANAS) – located in Johor, this “mini zoo” run by volunteers houses various stray and rescued animals.